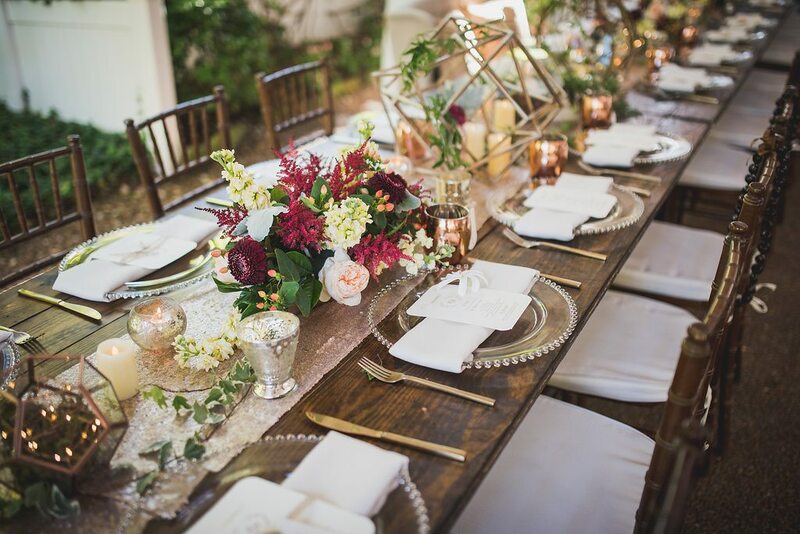 A wedding styled with dramatic rustic romance is a beautiful way to celebrate tying the knot, and Morgan and Nick did just that. 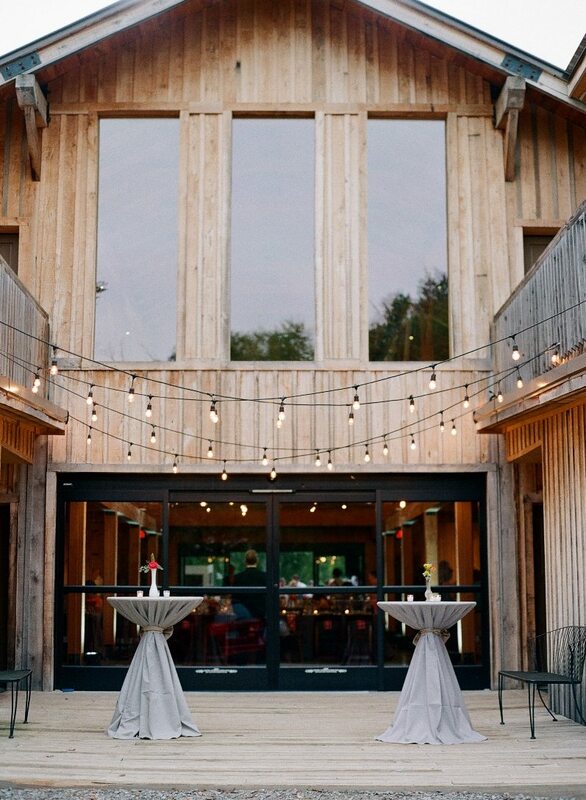 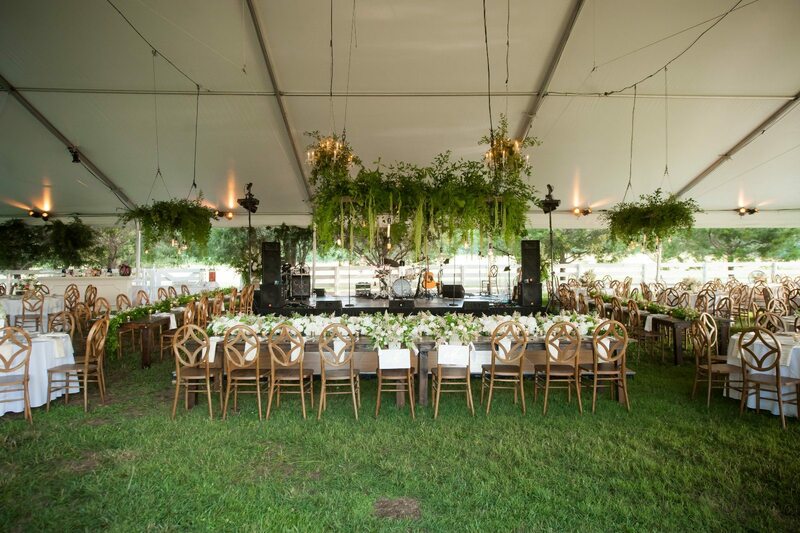 They whisked their guests away to the majestic Saddlewood Farms, where the secluded affair began with an unforgettable outdoor ceremony. 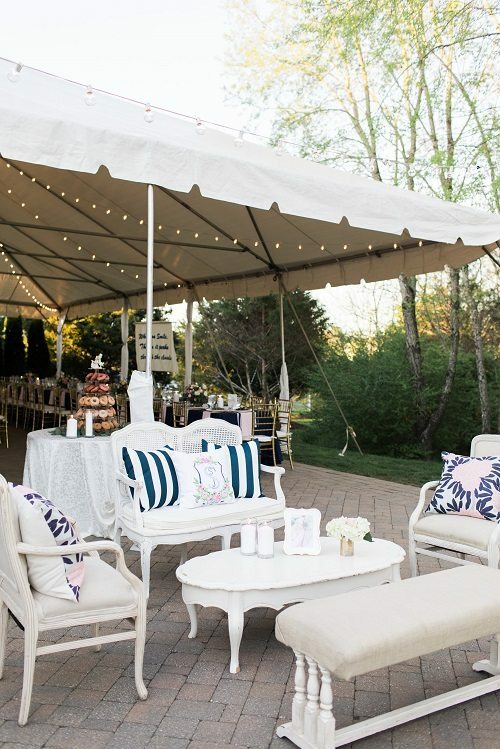 Family and friends were seated comfortably on the lawn with our white folding chairs before heading inside for cocktail hour, where our distinct lounge furniture set the scene. 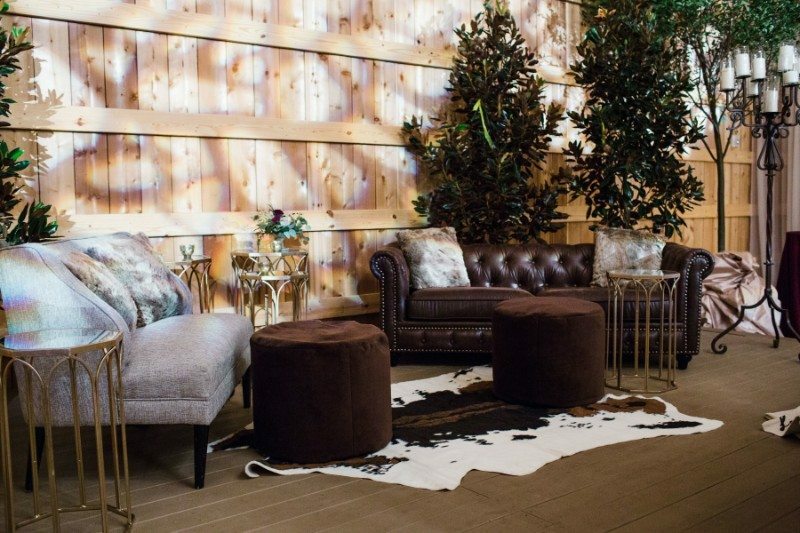 Our Bennett Leather Sofa, London Loveseat, Cheval Gold Mirror Side Table, and Chocolate Poufs were rustic romance defined and pulled together perfectly atop Cow Hide Rugs. 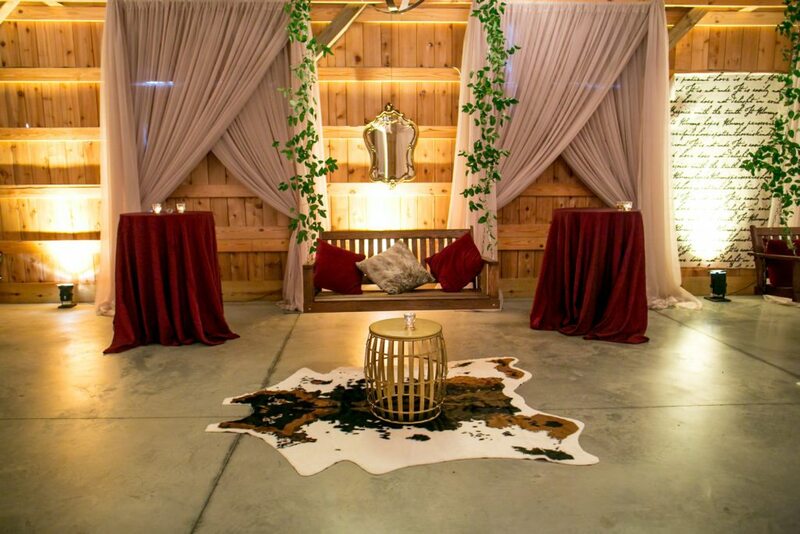 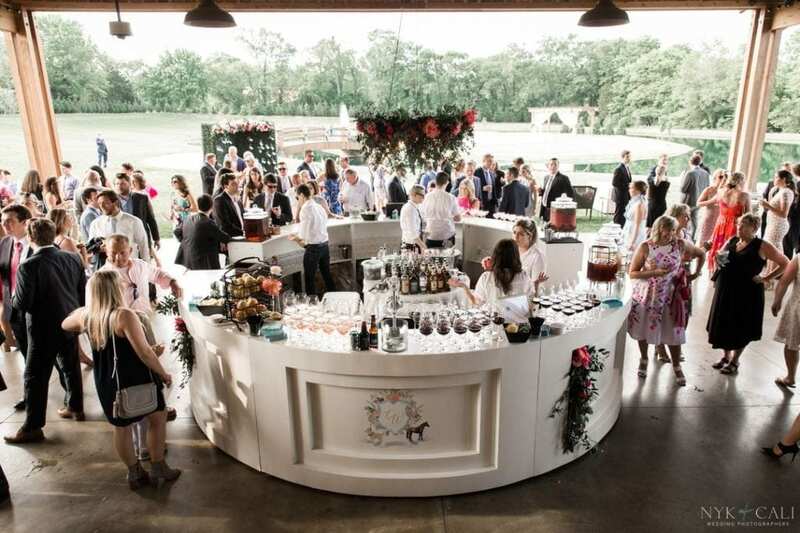 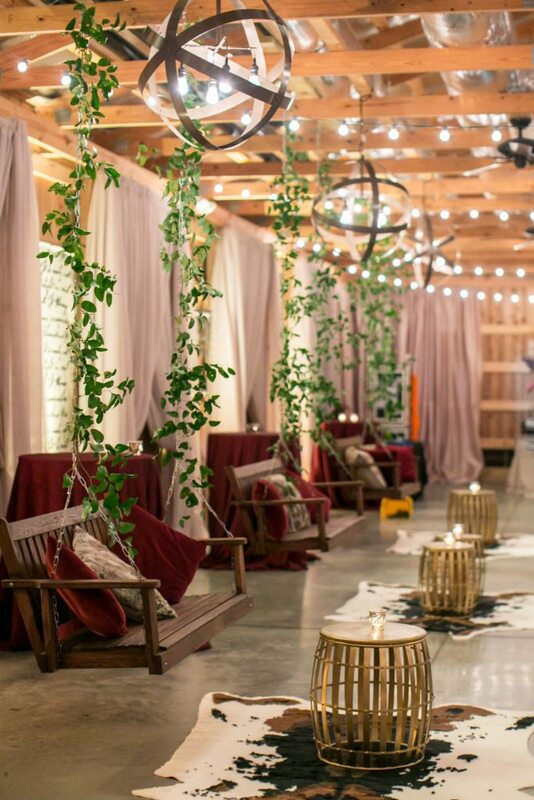 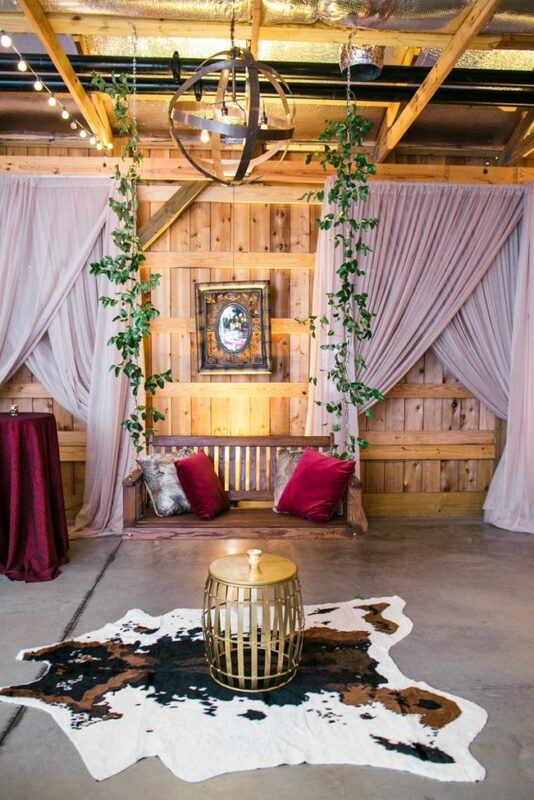 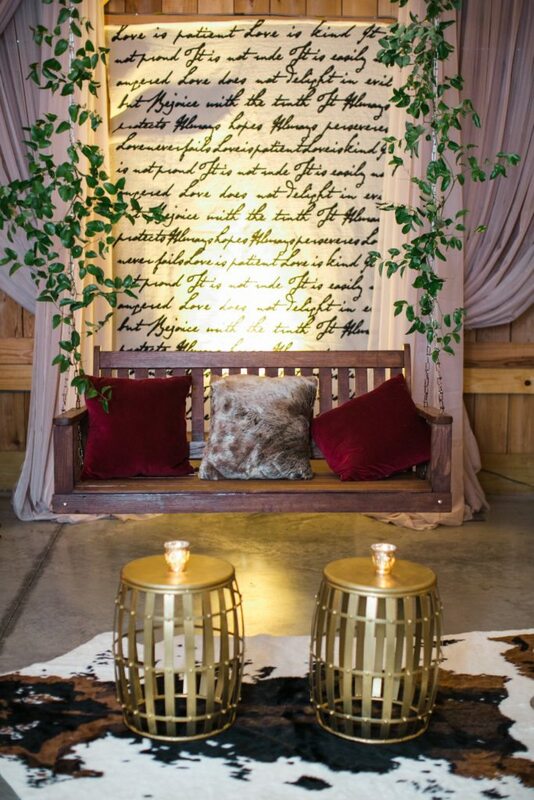 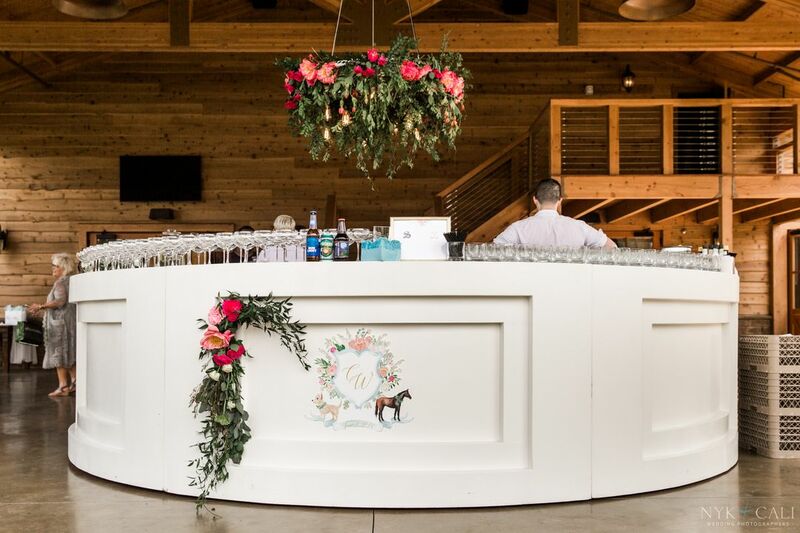 Throughout the massive barn, several of our Gold Conga Drum Side Tables were on display so guests could easily move around the barn and know they’d have somewhere to rest their drinks. 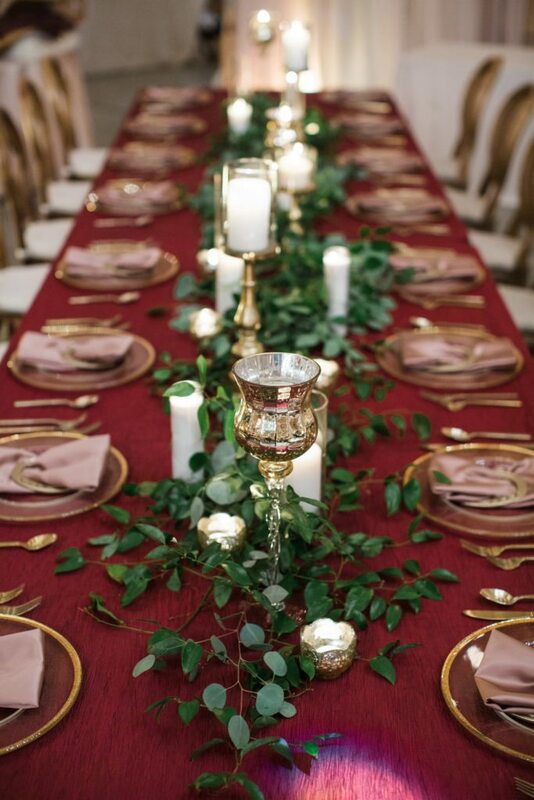 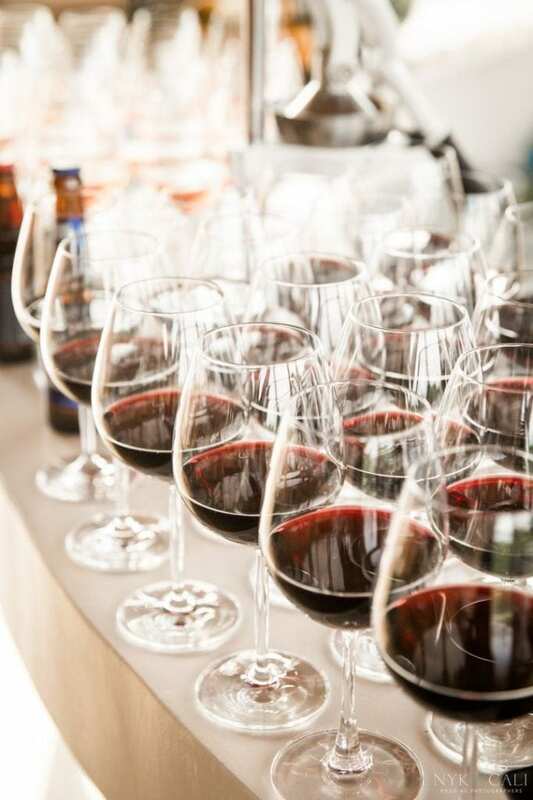 Dinner was an exquisite affair, with natural wood, gold, blush and burgundy at every turn. 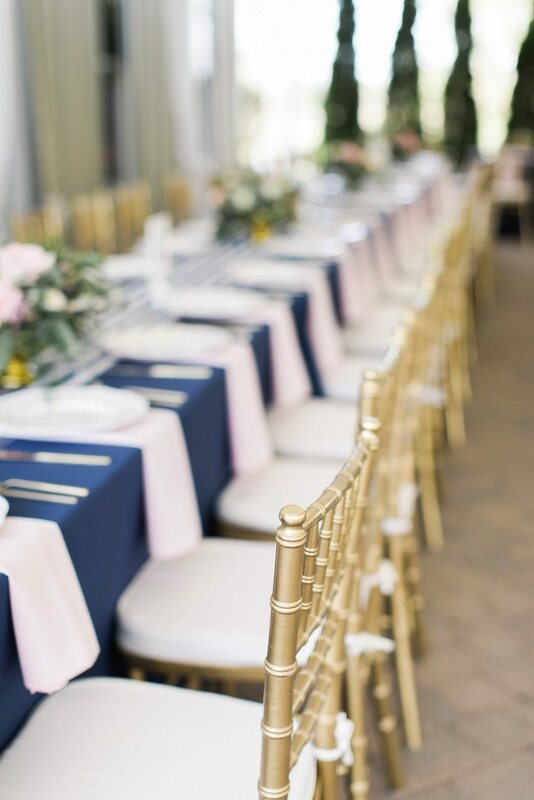 Our most-loved Harlin Dining Chairs with cushions were seated across from our Adeline Dining Chairs at the head table, while other family and friends were seated comfortably on Chiavari Dining Chairs. 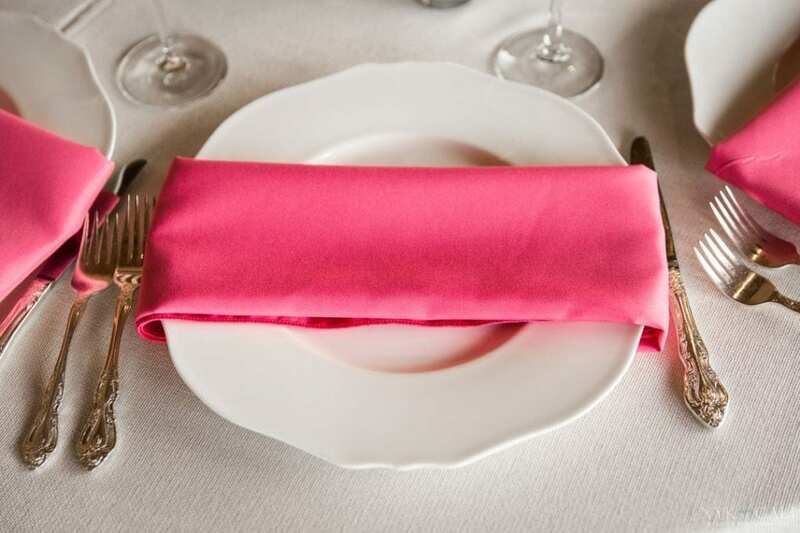 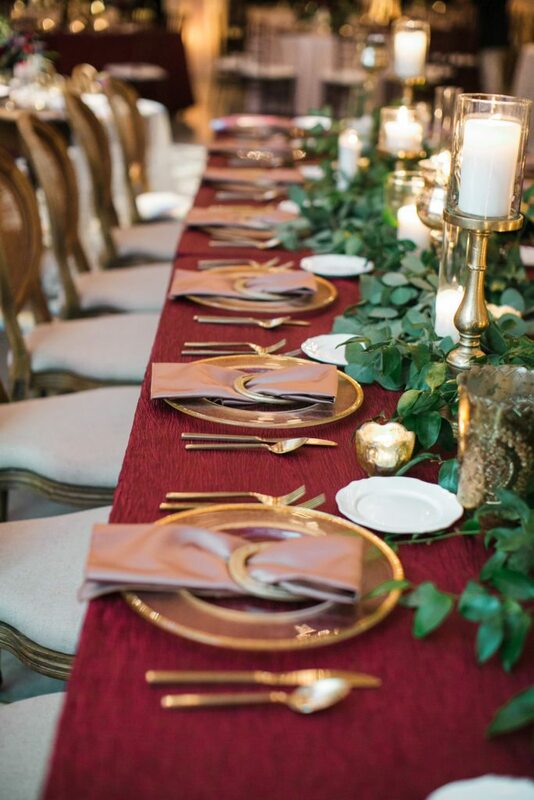 The head table featured table linens in rich burgundy, while round tables displayed blush dinner napkins for a bit of femininity. 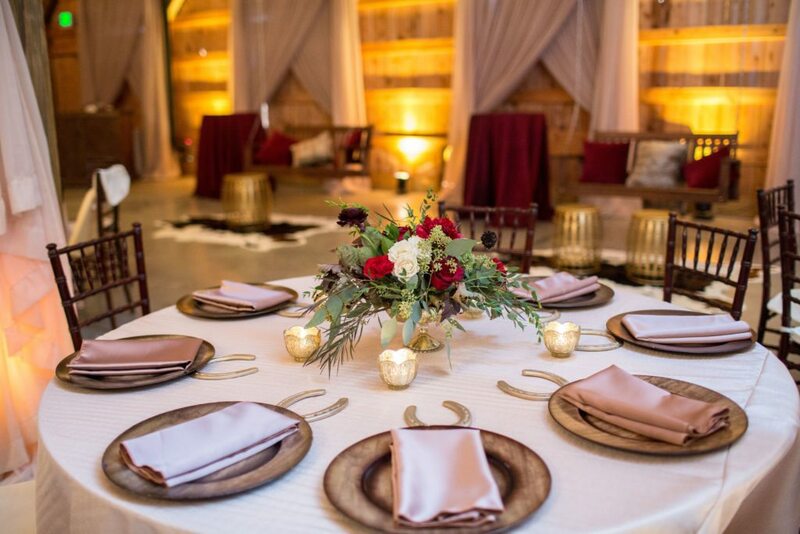 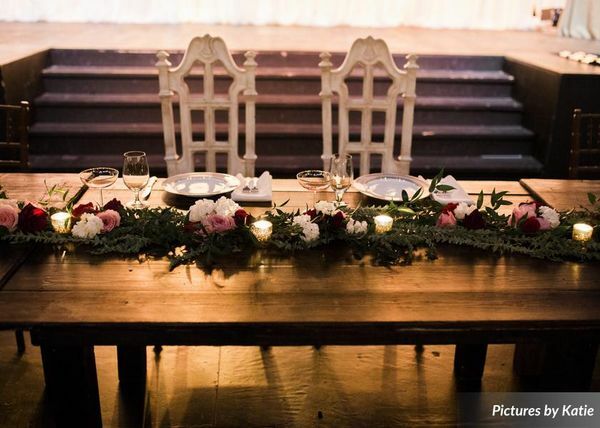 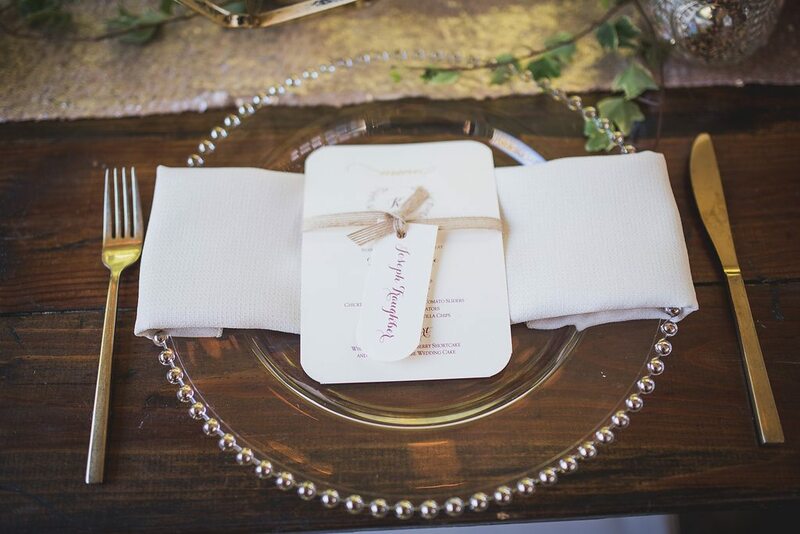 Hob Knob Glassware, Glass Chargers with Gold Rim, and Austin Flatware completed the tablescapes, with Wood Round Chargers rounding out the details of this magical rustic romance design. 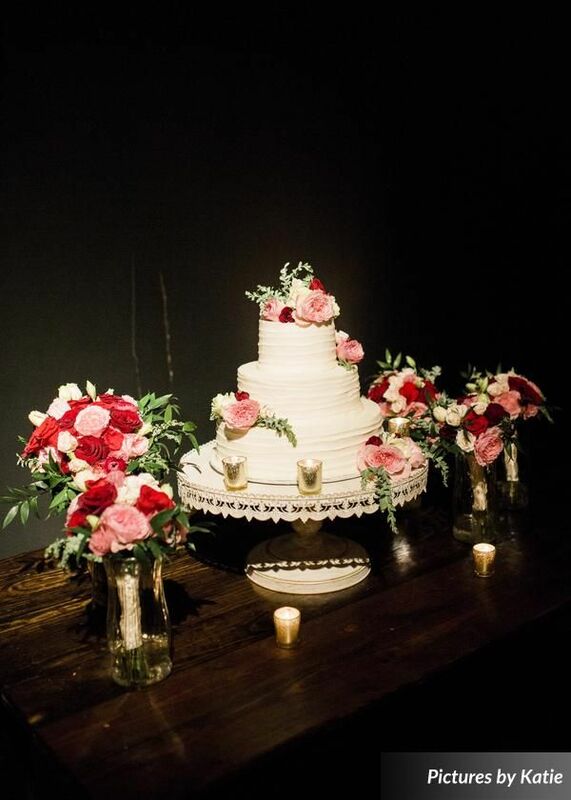 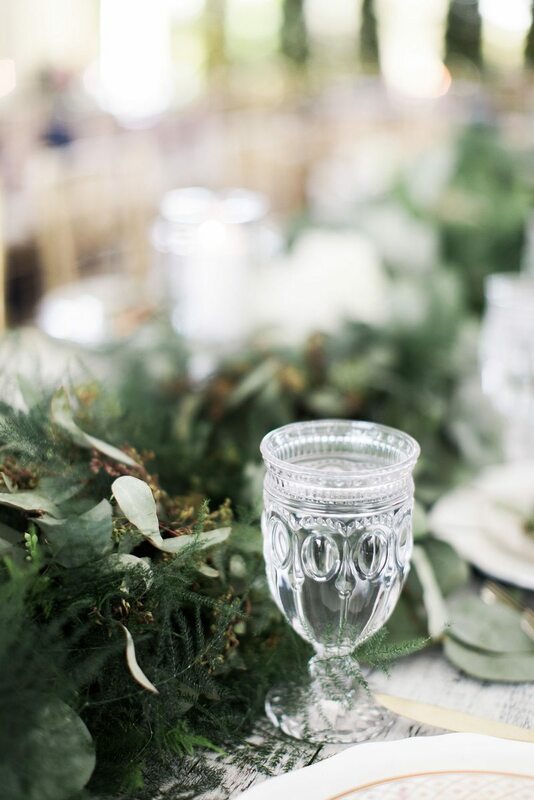 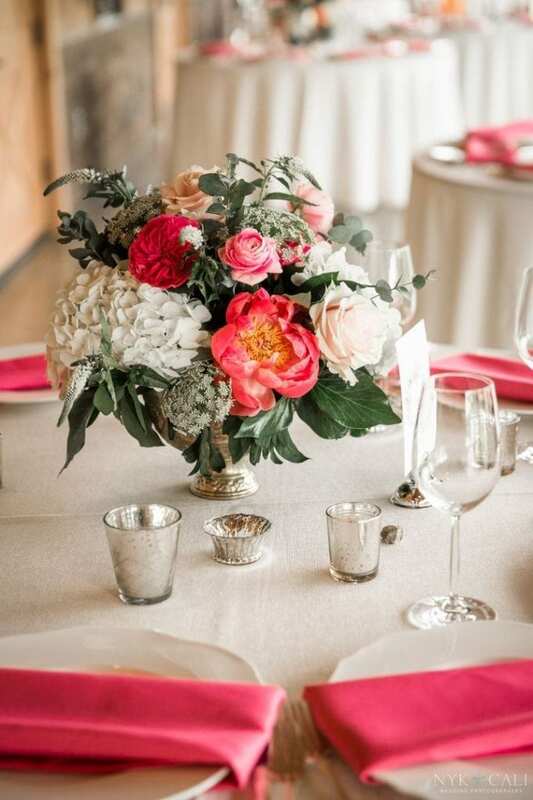 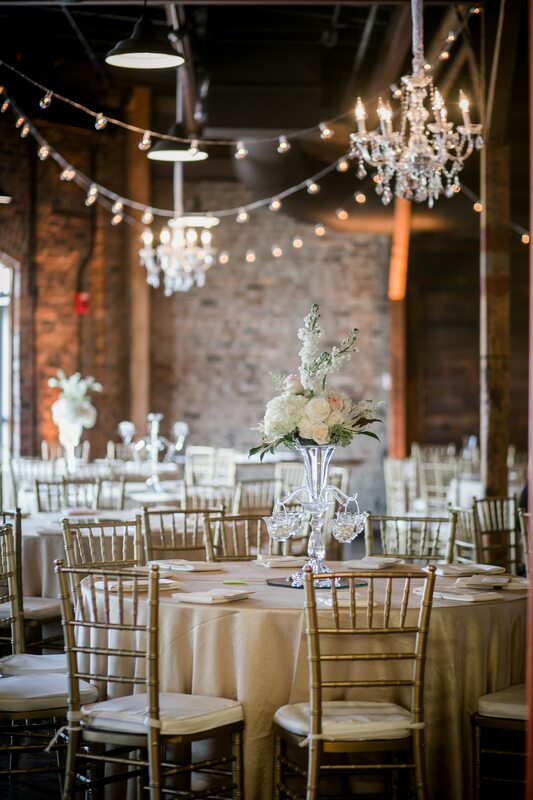 Thanks so much to Laurie D’Anne Events for pulling all the elegant details together, and to SheHeWe Photography for sharing these photos with us. 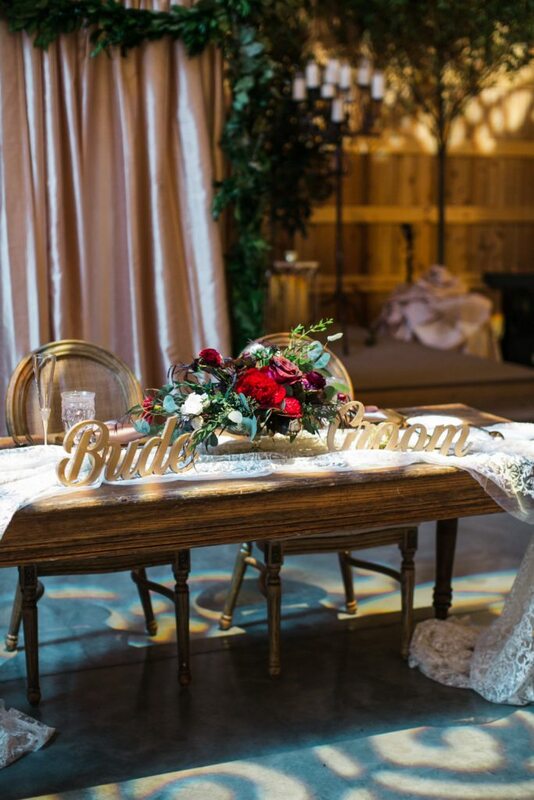 Candice and Judd’s Houston Station wedding in Nashville was a charming Southern soiree with the sweetest rustic vintage details. 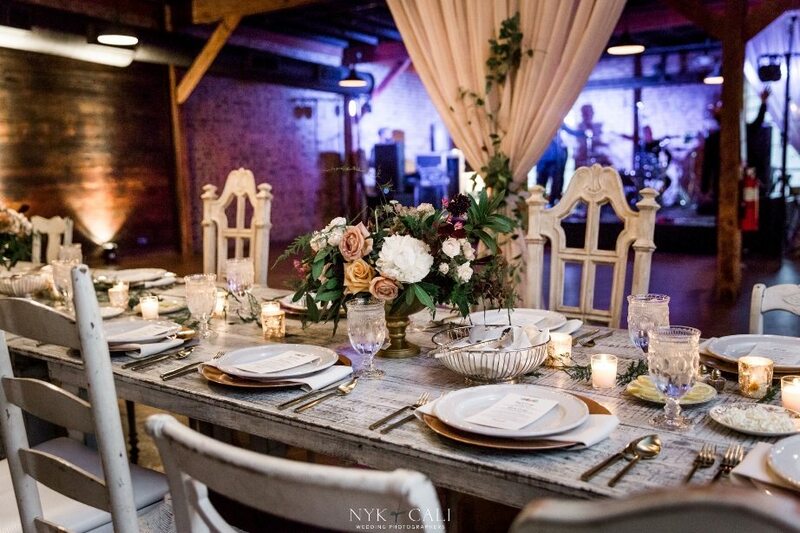 We love how this couple expertly combined chairs from our Vintage Prop Shoppe with Whitewash Farm Tables and our Hobknob Glassware for a gorgeous wedding design. 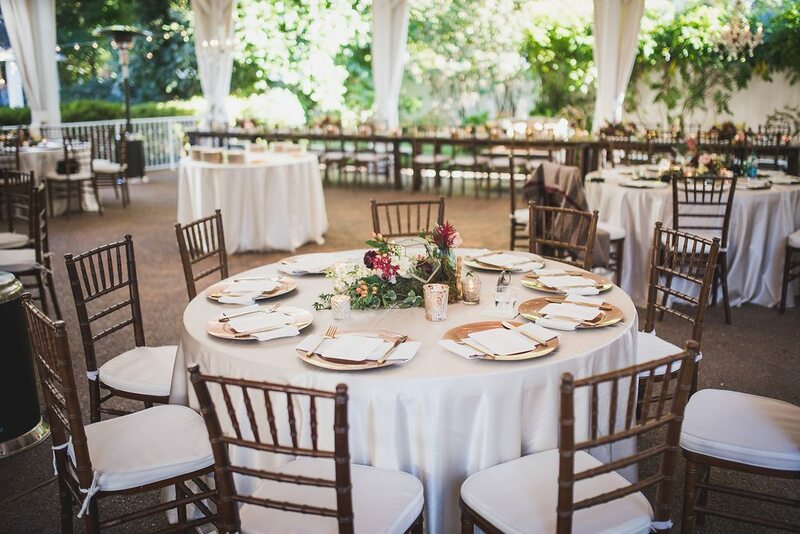 Our Annabelle Chair, Annabelle Arm Chair, Bonnie Chair, Christopher Chair, Clyde Chair, and Provence Chairs, were placed around the main table for the most delightful design – who knew mismatched could be so perfect?! 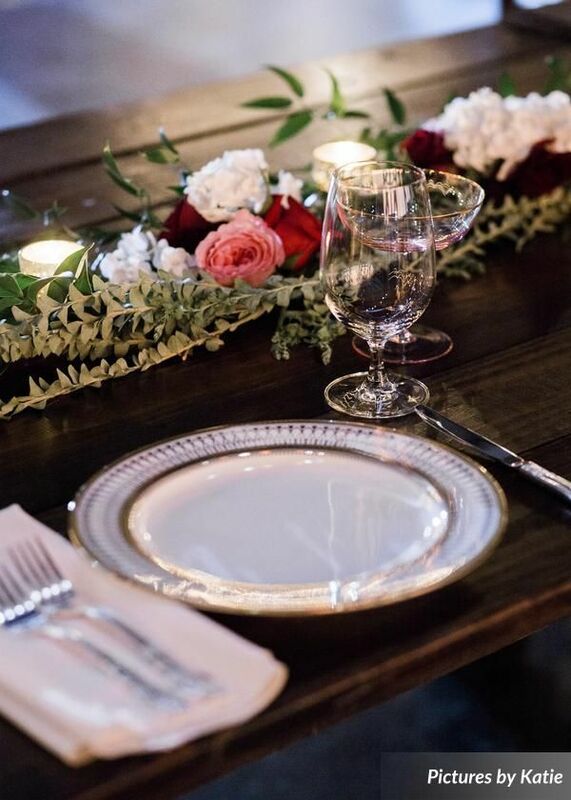 Gold details in tablescape, including Gold Charger Plates, Artisan China and Austin Flatware made for an elegant tablescape. 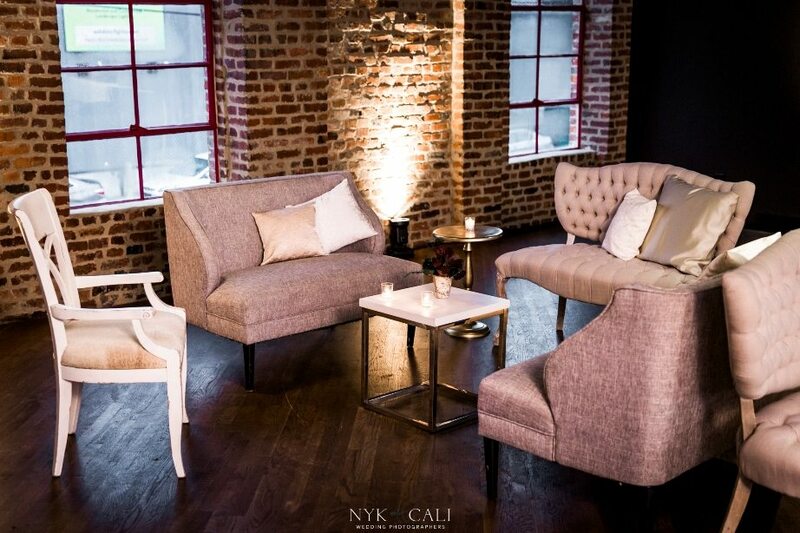 Cross-back Chairs were showcased during cocktail hour and dinner, keeping the style decidedly rustic, while a gorgeous lounge area with modern furniture added a sleek and chic touch. 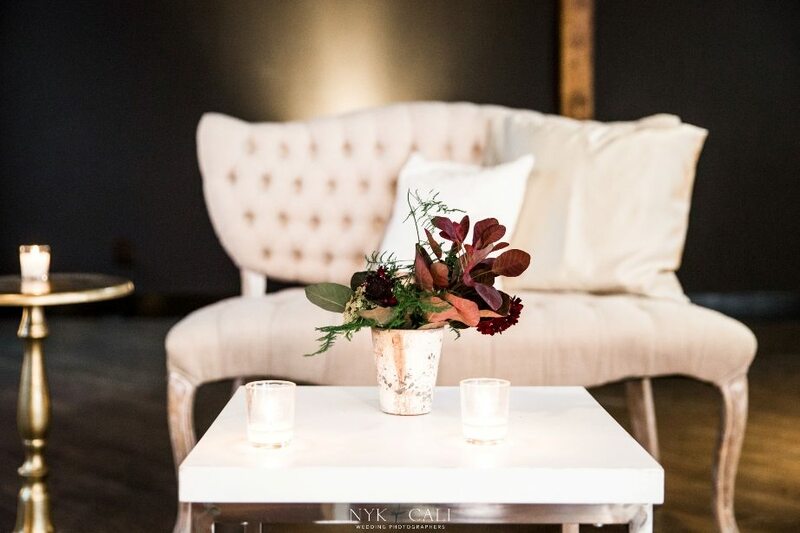 Our London Loveseat, Tessa Tufted Loveseat, Mykonos Side Table and Fitzgerald Gold Side Table made for a stylish and comfortable lounge area – the perfect place for guests to mix and mingle. 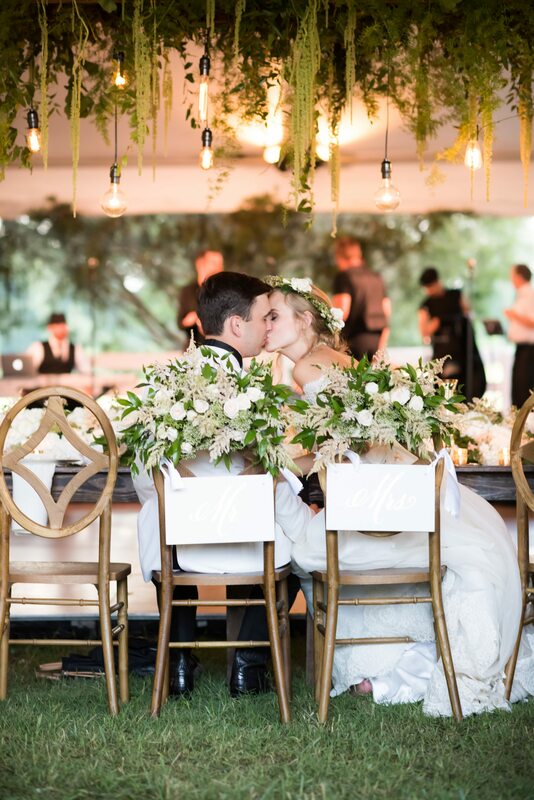 Such a beautiful modern-day vintage wedding! 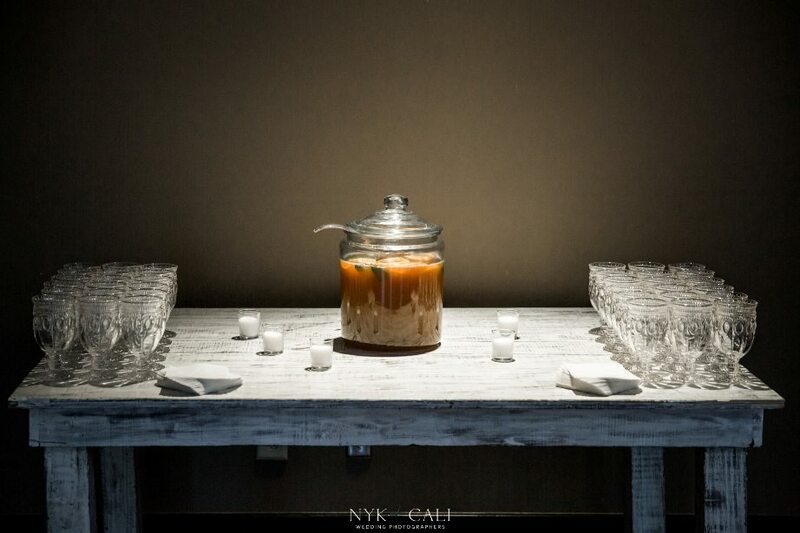 Thank you so much to Nyk and Cali for capturing the details! 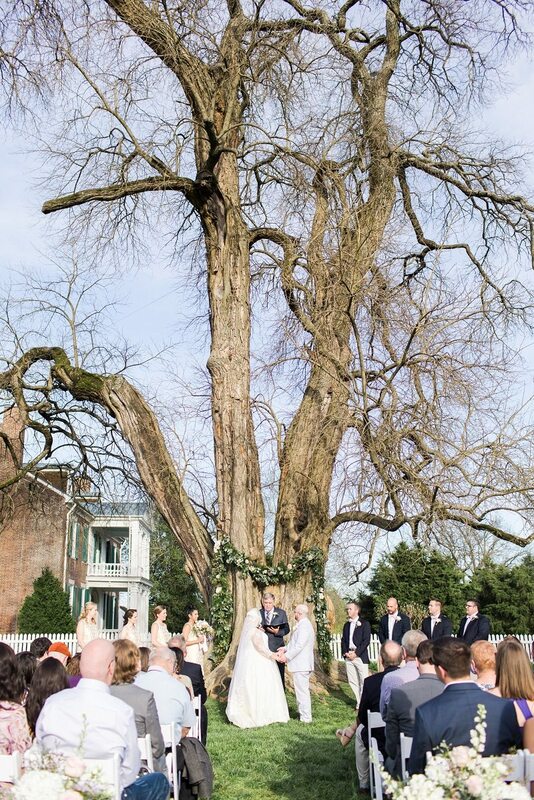 Stacey and Jonathan had such a gorgeous April wedding at the Carnton Plantation. 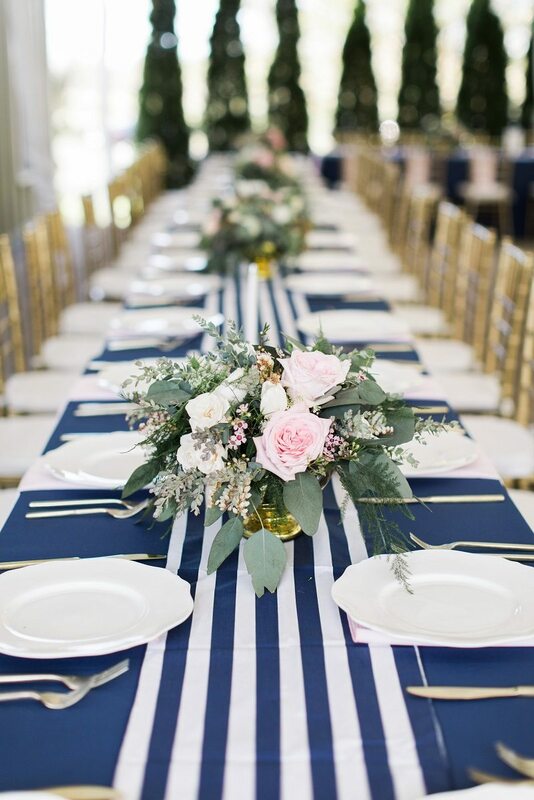 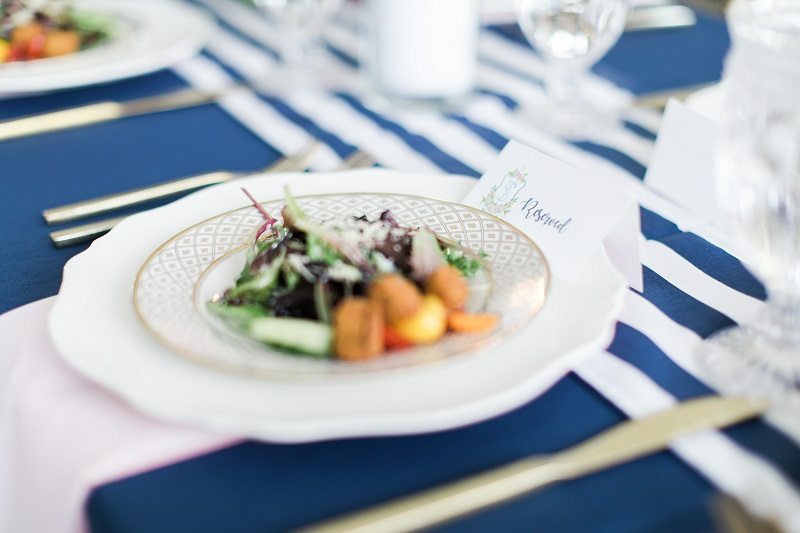 Using their wedding logo as decor inspiration, this wedding was designed with navy blue stripes at the forefront and used gold and soft pink as accents. 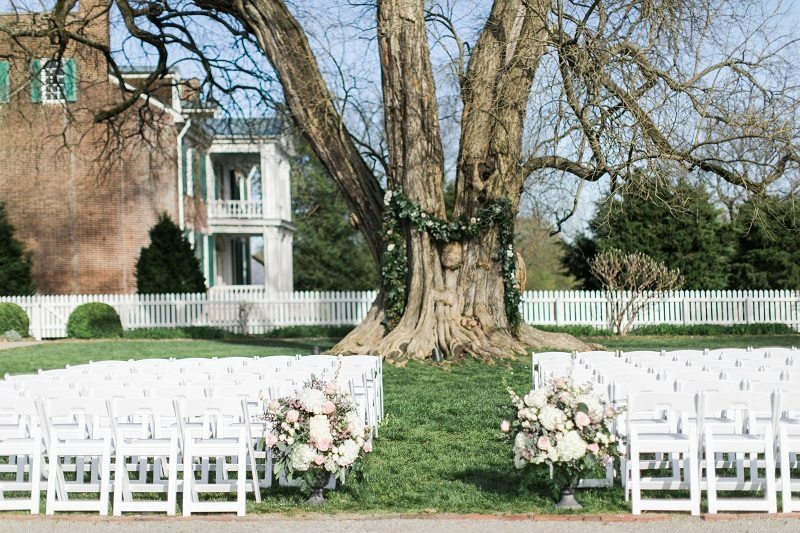 For the ceremony, our White Folding Chairs provided family and friends a comfortable cushion to sit on as they watched the newlyweds exchange vows under a majestic tree. 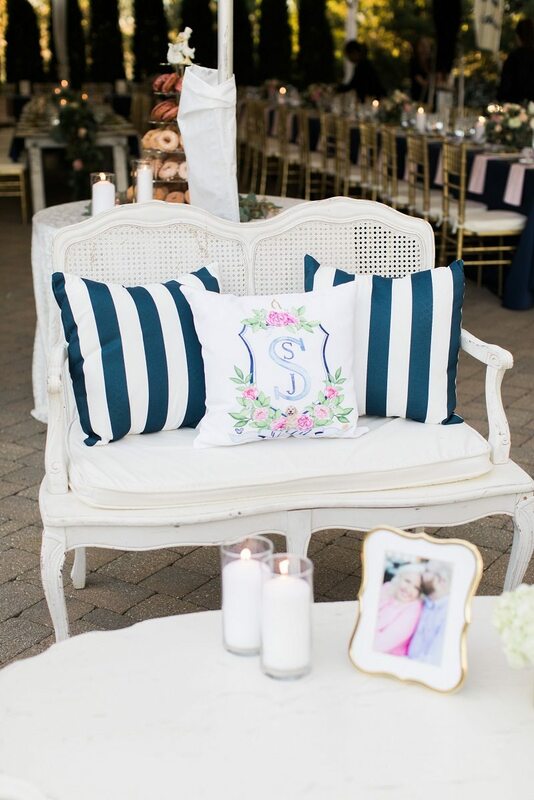 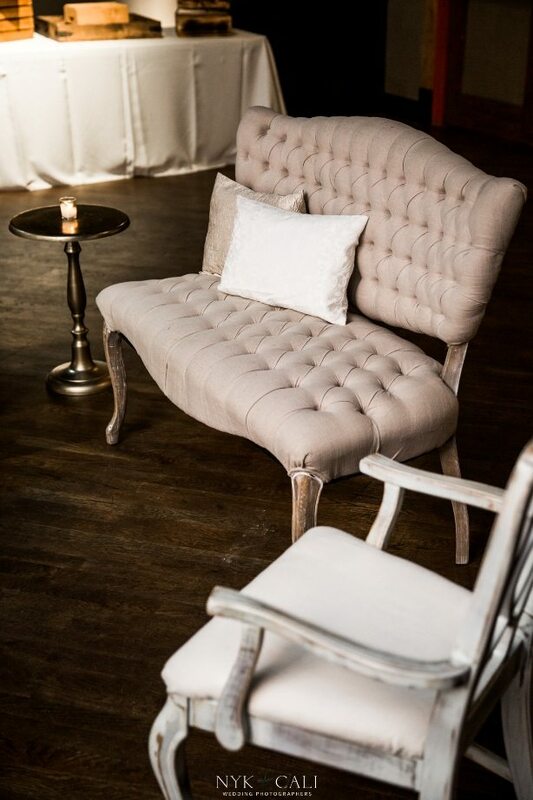 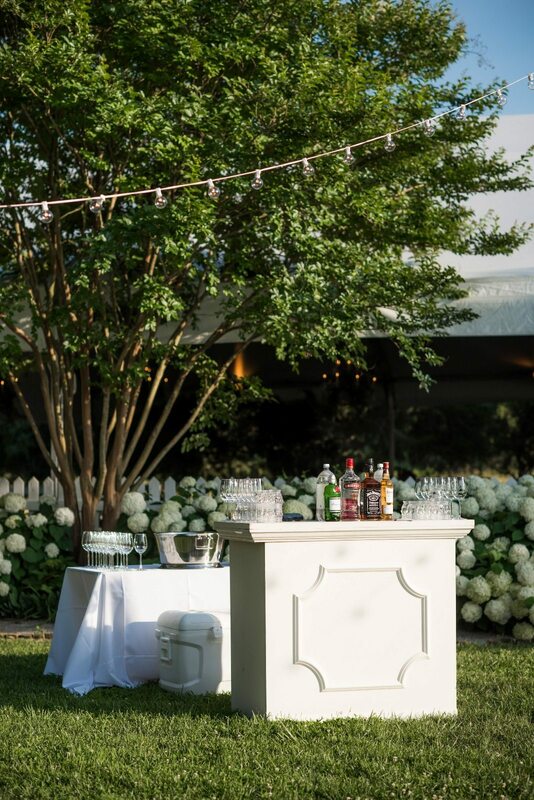 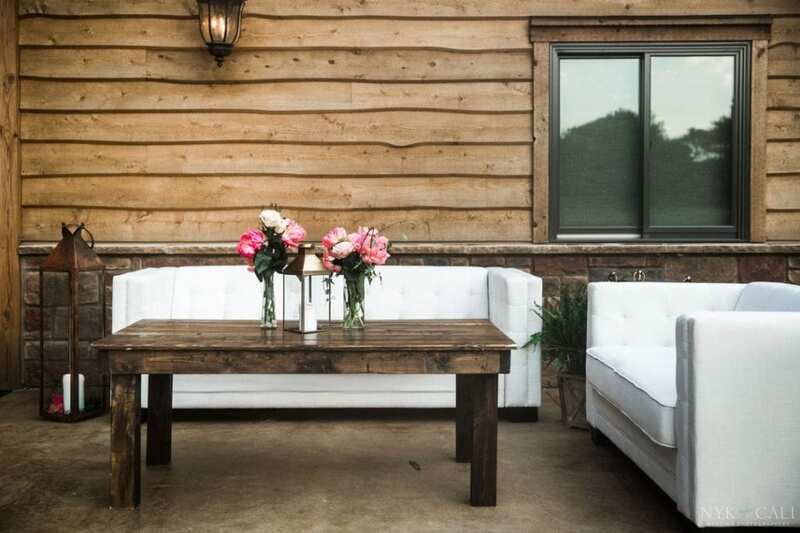 A vintage seating area was designed in front of the reception tent that featured our Vintage Charlie Bench, Vintage Jolie Loveseat, and Vintage Roper Arm Chairs around our Vintage Leona Coffee Table – the perfect place for guests to lounge and mingle before finding their seats. 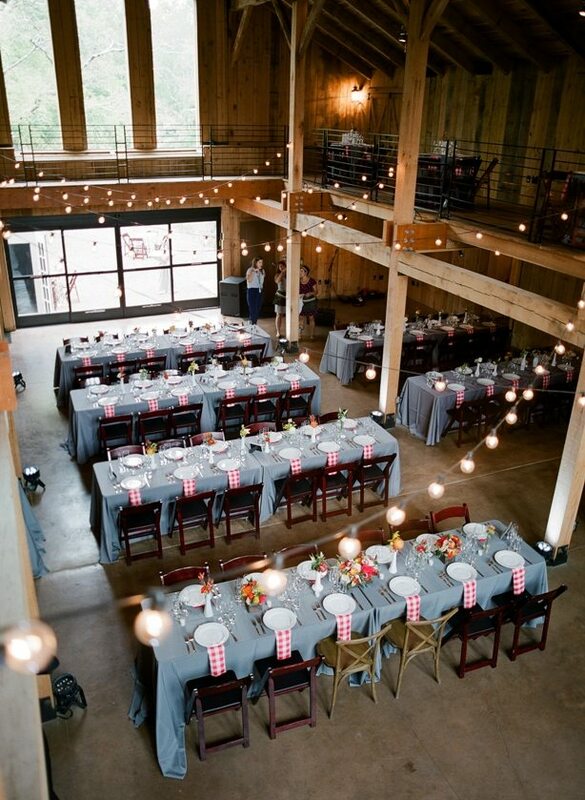 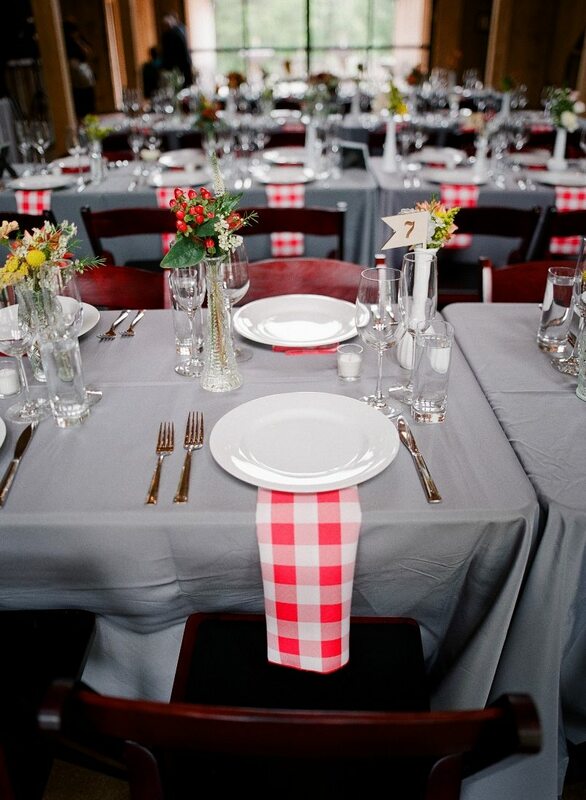 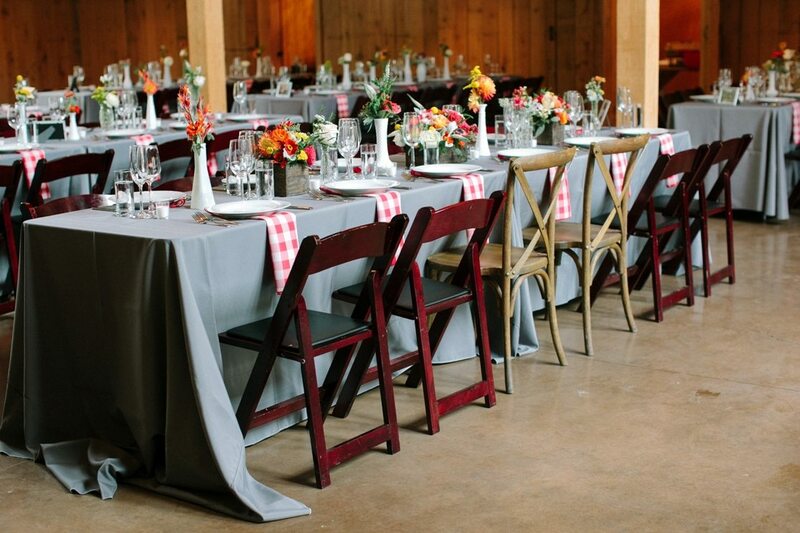 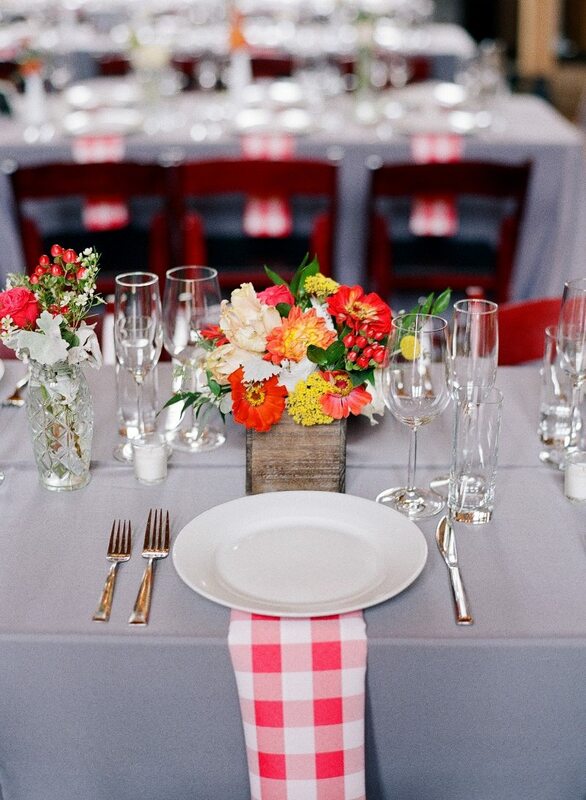 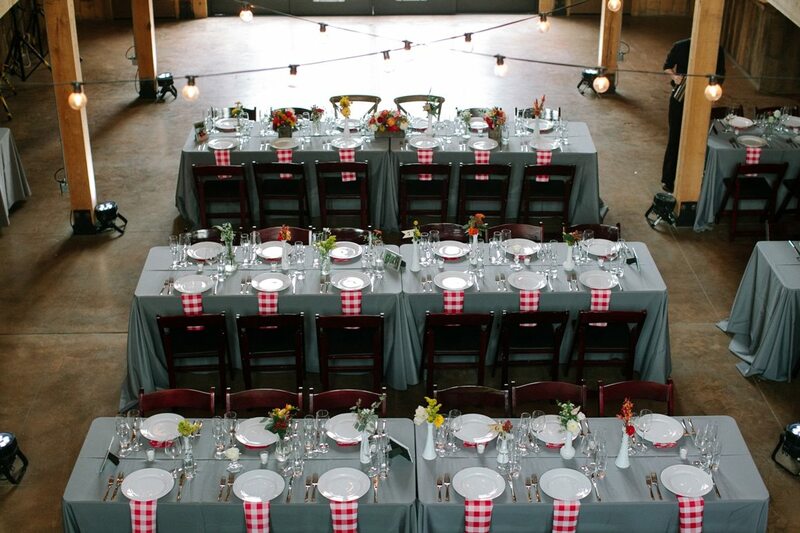 For the reception, two separately coordinated tablescapes were used to set the scene. 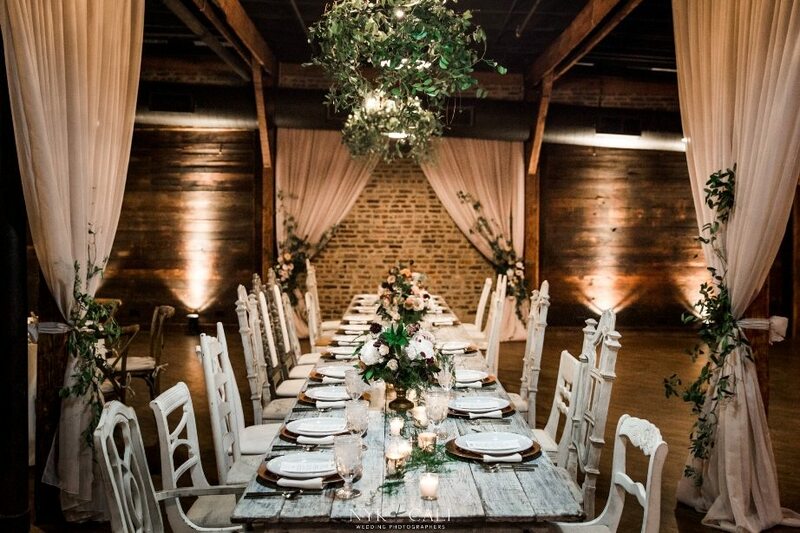 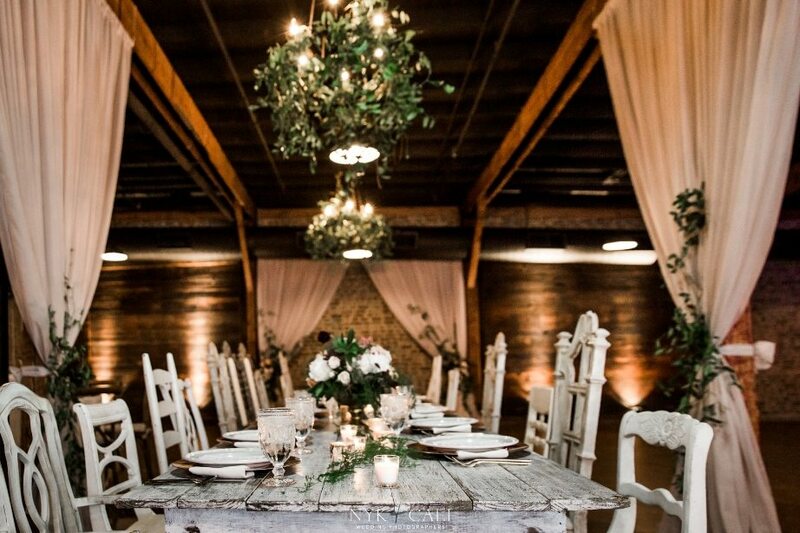 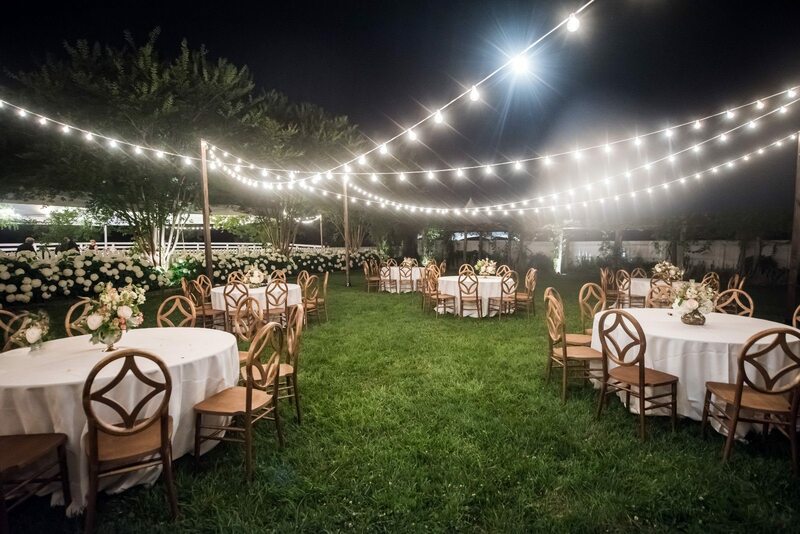 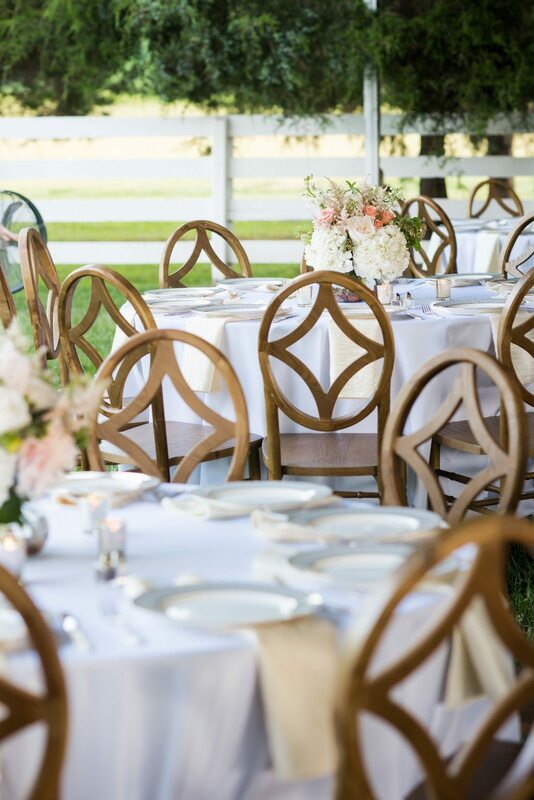 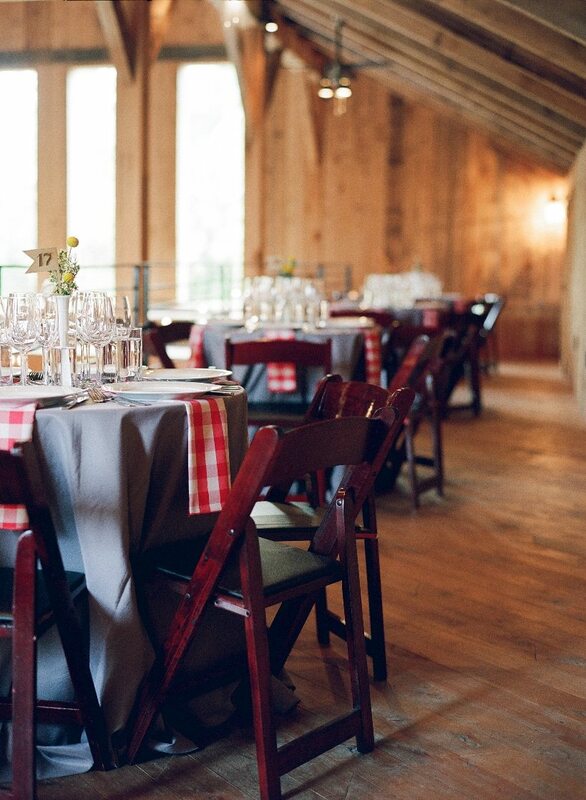 Gold Chiavari chairs around our White Washed Farm Tables provided a formal blueprint for the reception design. 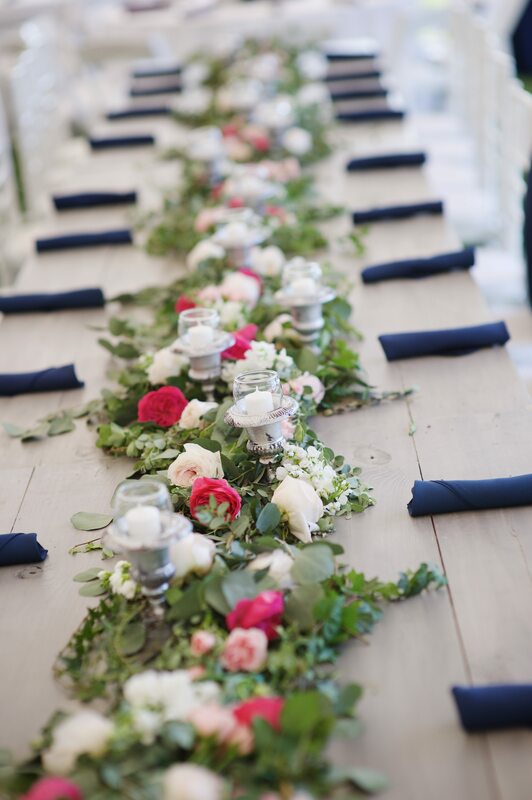 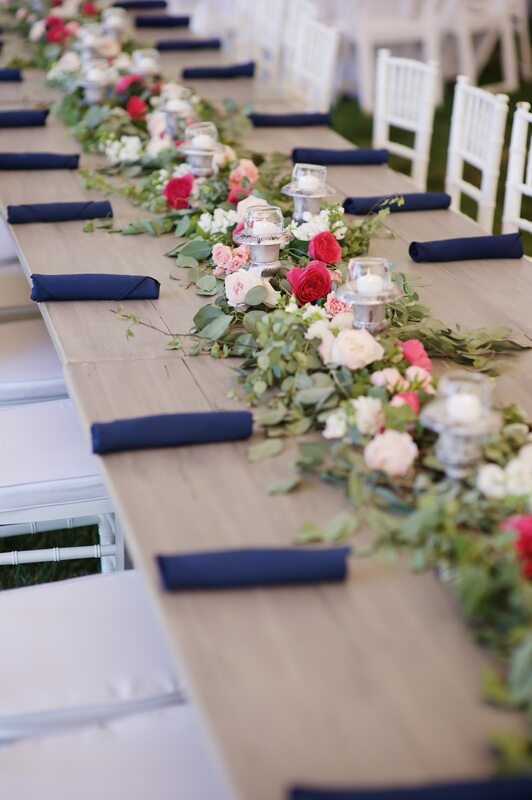 The head table included bare farm tables, our Blue Satin Dinner Napkin, Hob Knob Glassware, and a floral garland as the centerpiece. 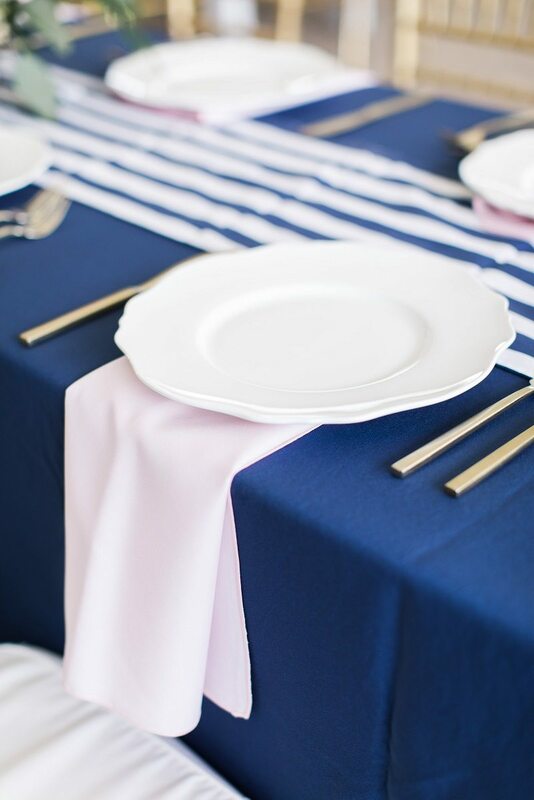 Surrounding tables were set with navy blue tablecloths, blue and white striped table runners, and Light Pink Satin Dinner Napkins. 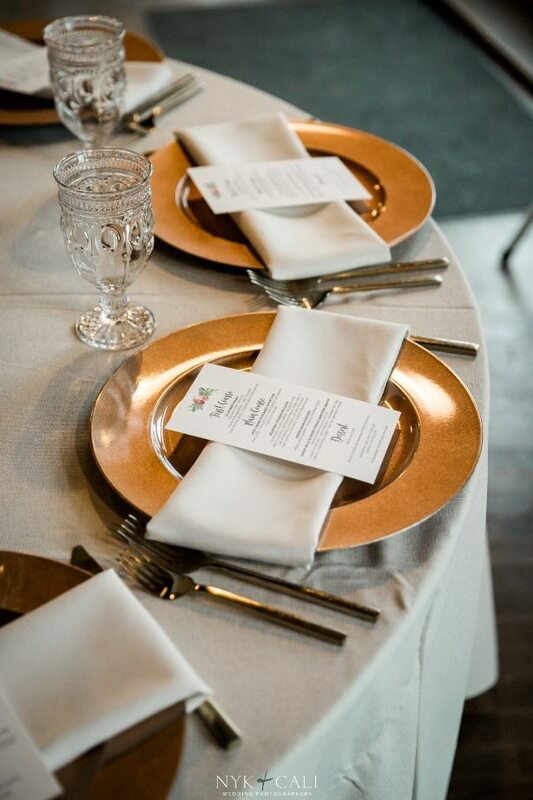 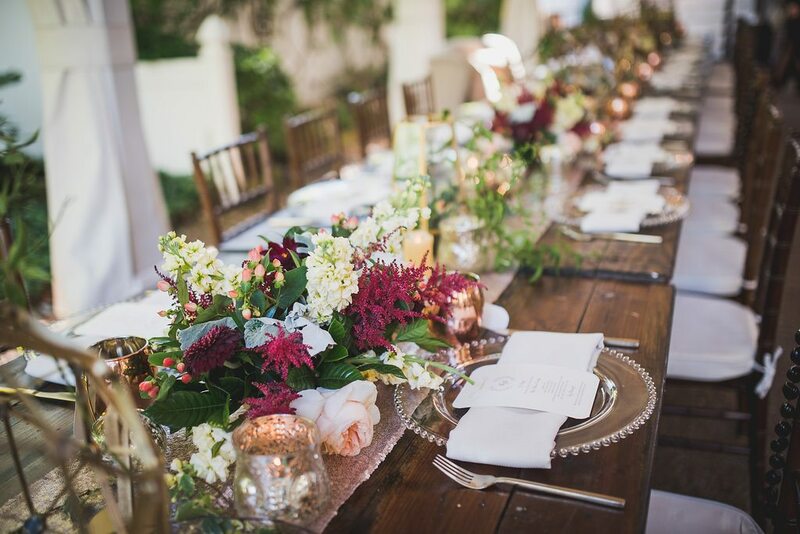 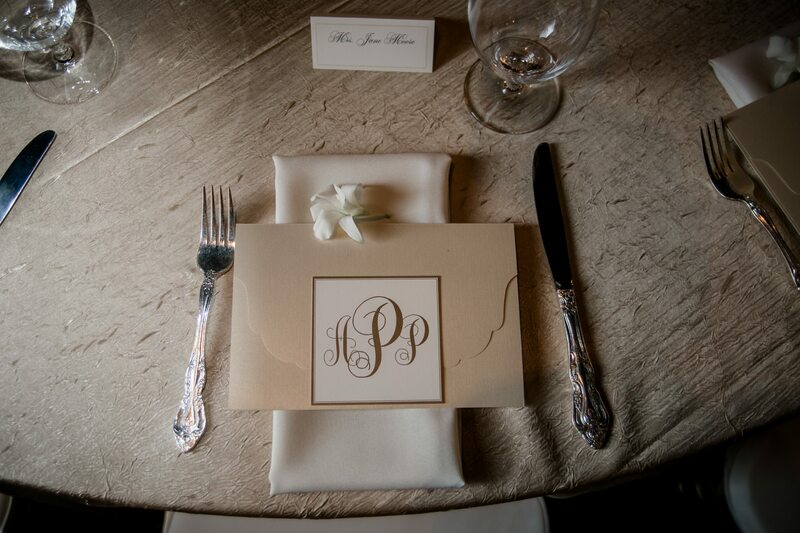 Each tablescape used our Austin Gold Flatware, Darcy China and the Gold Ophelia China for an elegant look. 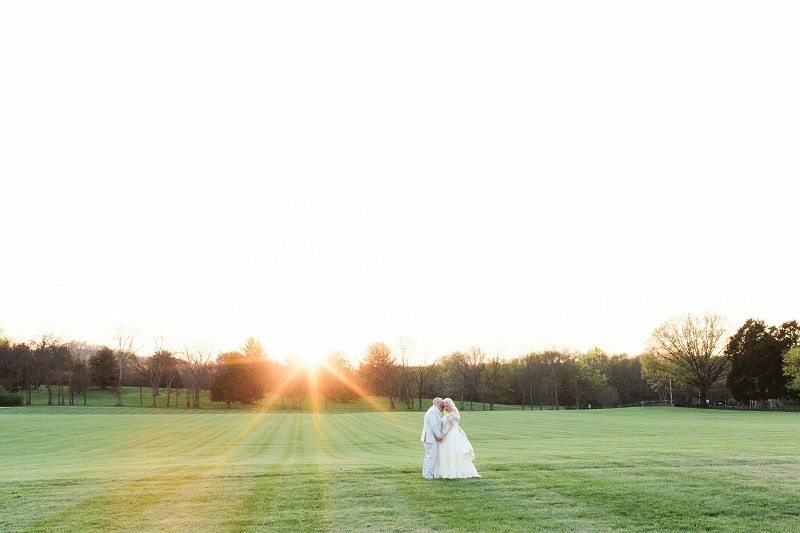 Thank you so much to Ivan and Louise Photography for capturing this gorgeous day! 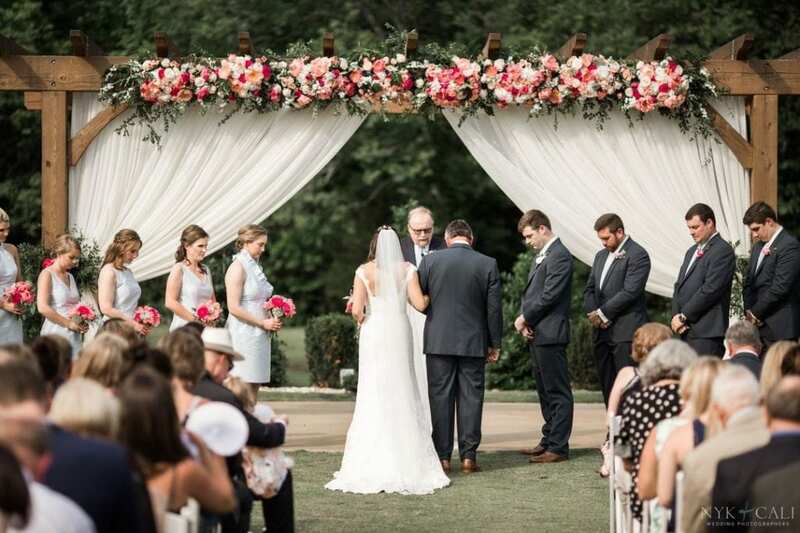 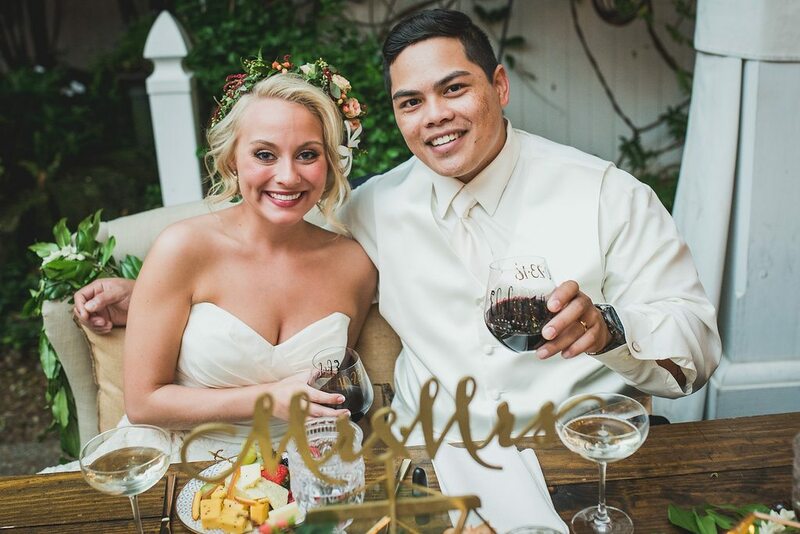 Kalee and Aaron were married in the beautiful outdoor garden at CJ’s Off the Square with gold and rose gold details. 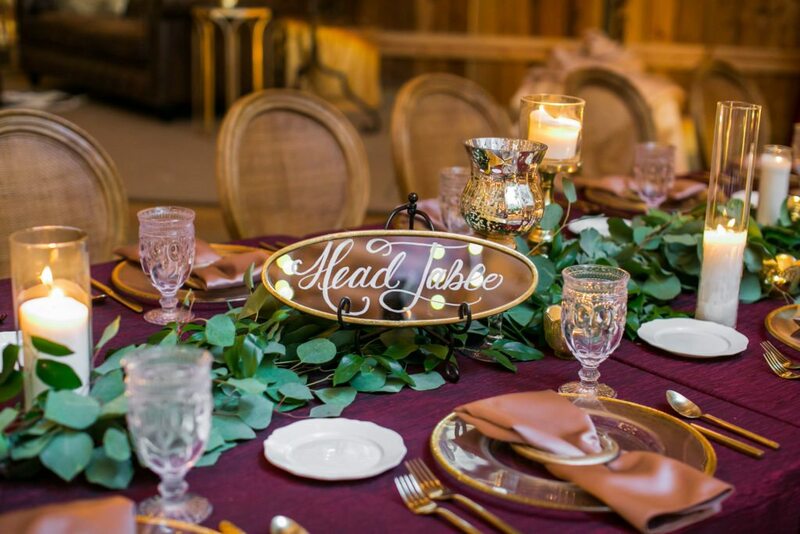 For their reception, a mixed seating plan allowed for multiple coordinating tablescapes to be used creating a chic look for any fall couple. 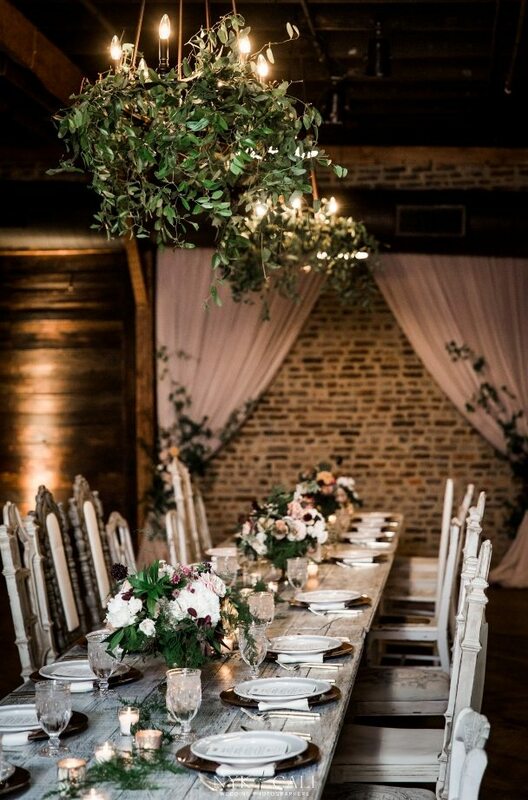 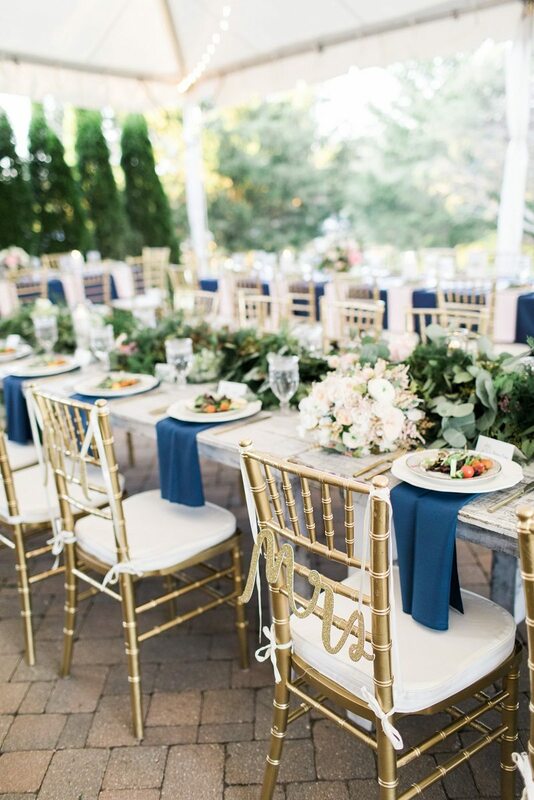 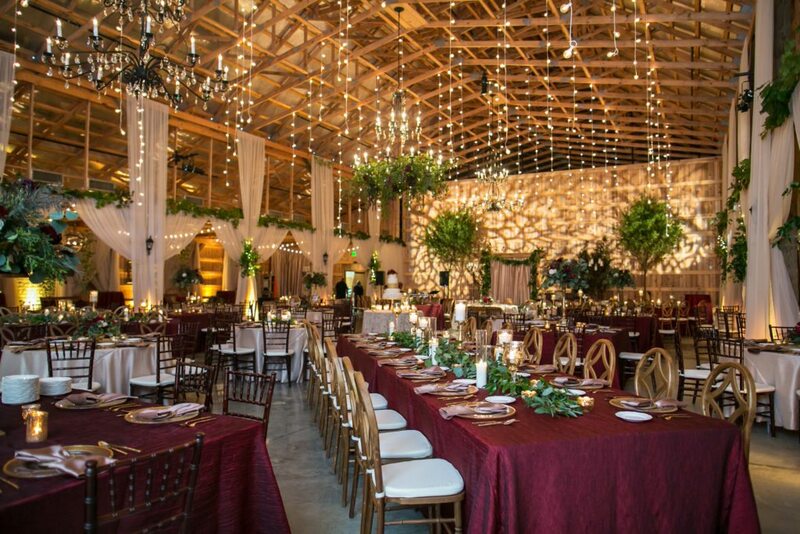 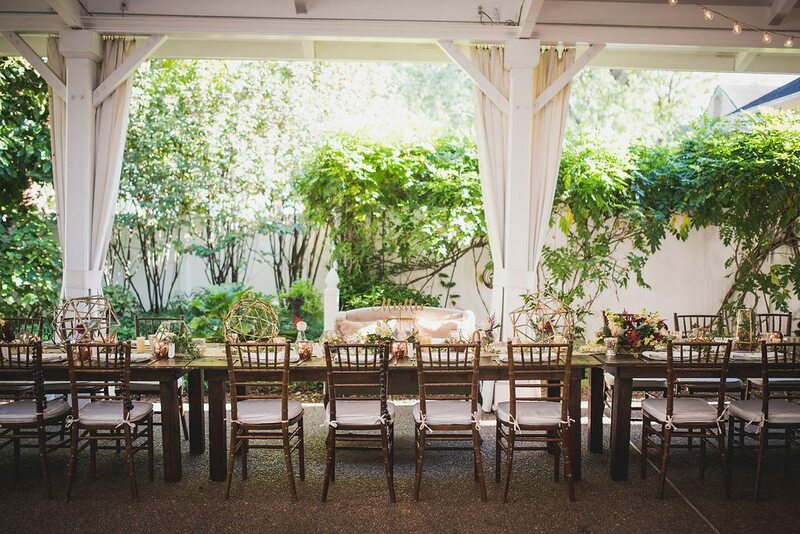 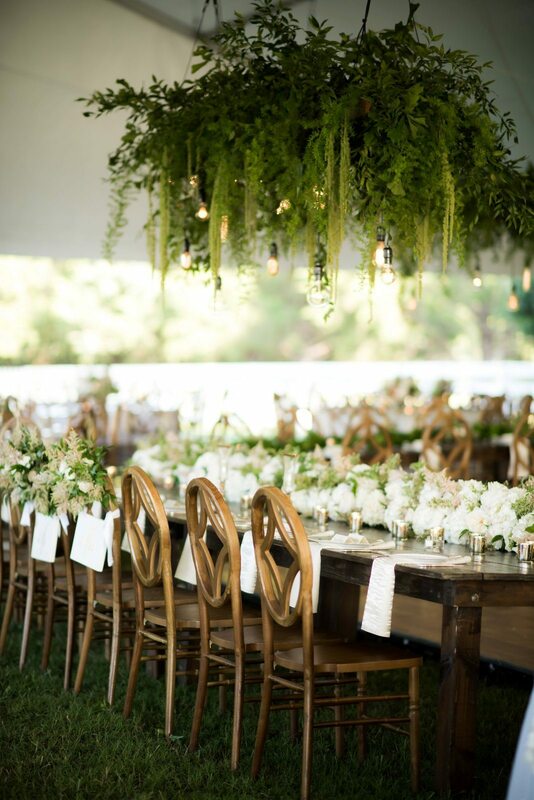 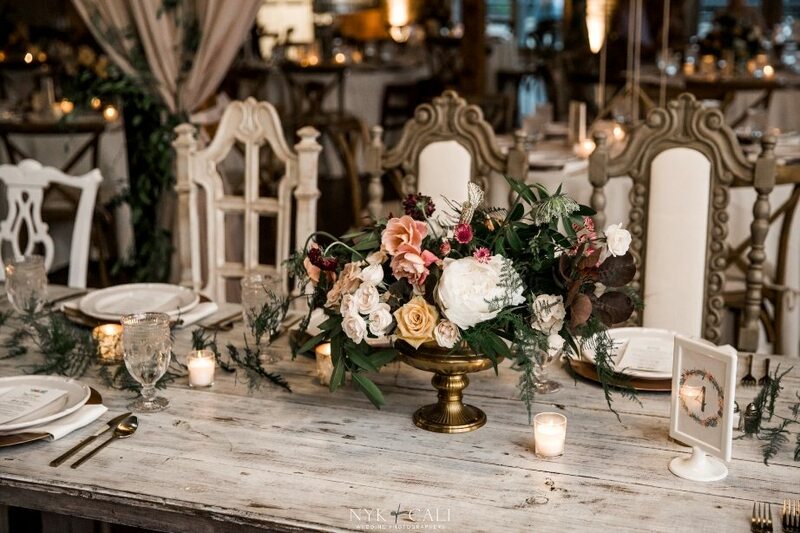 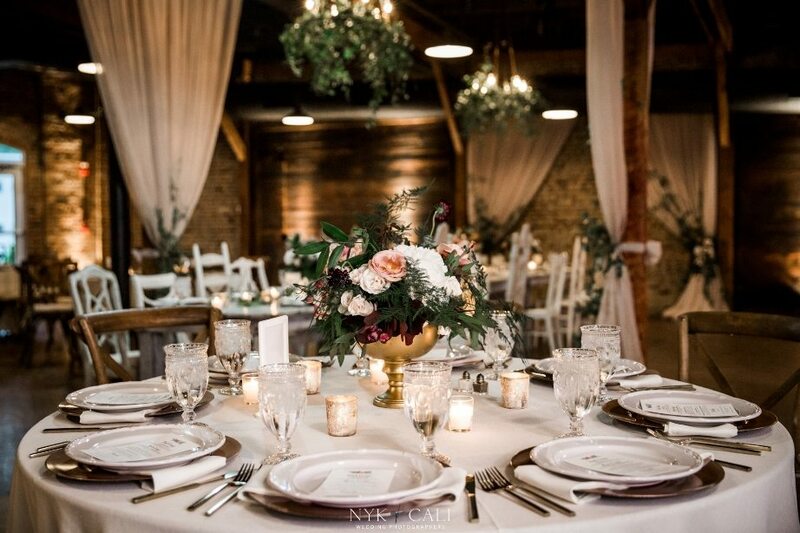 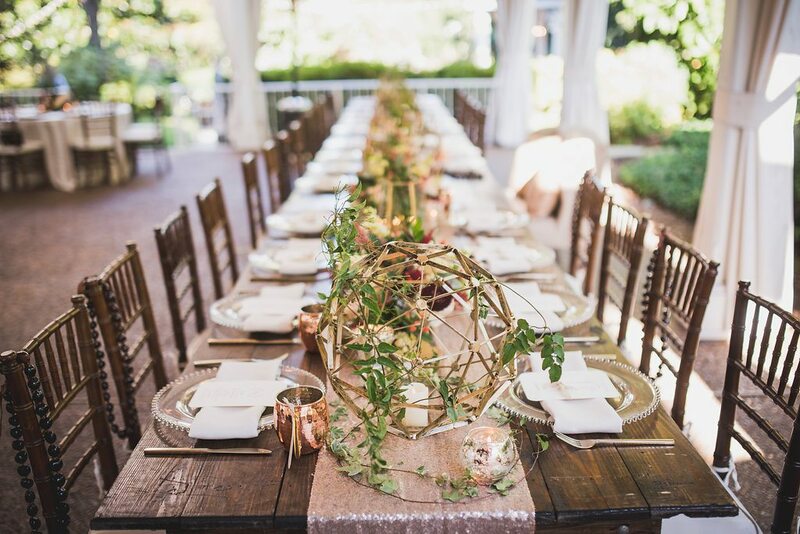 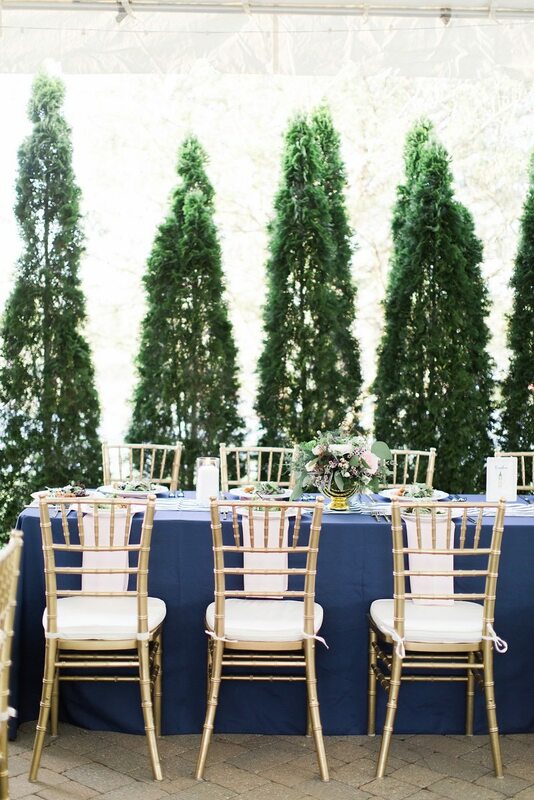 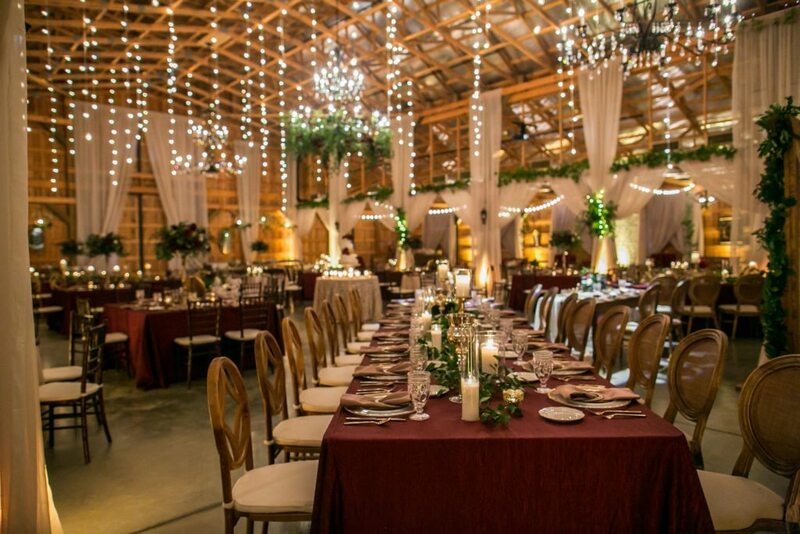 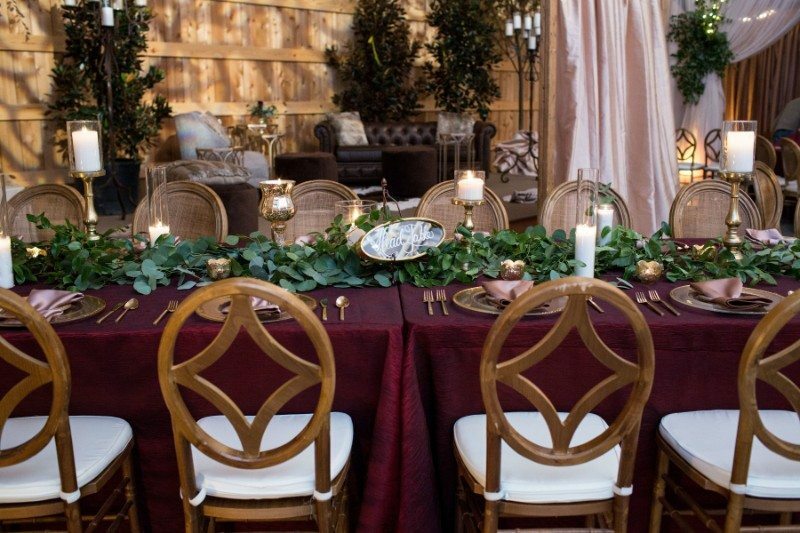 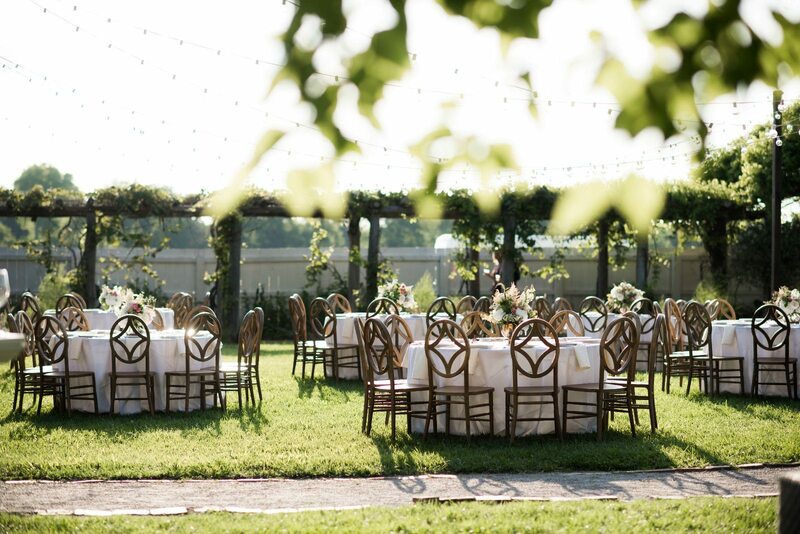 Our Fruitwood Farm Tables were set with Fruitwood Chiavari Chairs, Belmont Chargers, and our Gold Metal Spheres. 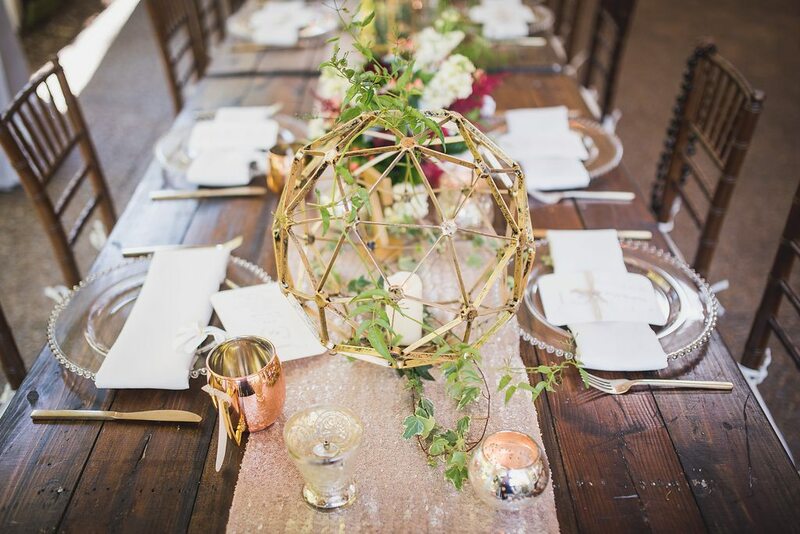 Round Tables were topped with Champagne Dupioni Linens, Gold Round Laquer Charger Plates, and featured our Gold Metal Intersect Cube as the centerpiece. 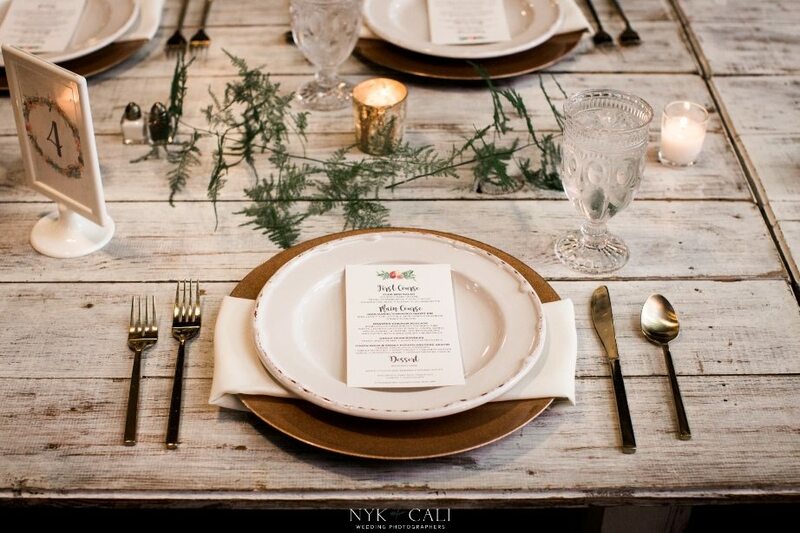 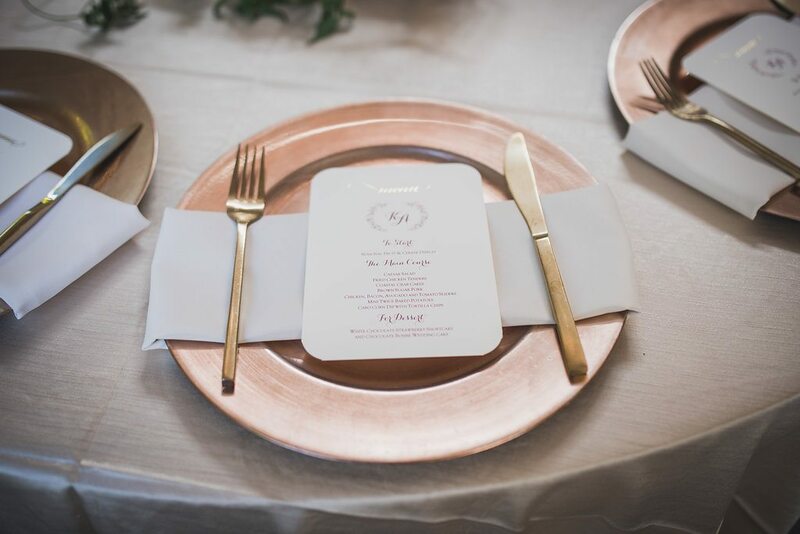 Each guest’s setting was completed with Gold Austin Flatware and a Copper Moscow Mule as the guest favor. 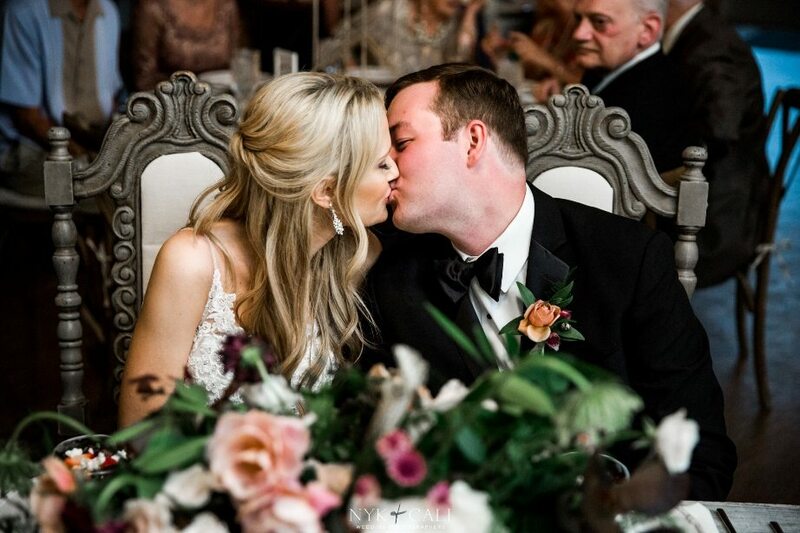 The sweet newlyweds sat together on our Tessa Tufted Loveseat as they dined off of Gold Hamlet China and toasted their marriage with our Gatsby Champagne Coupe. 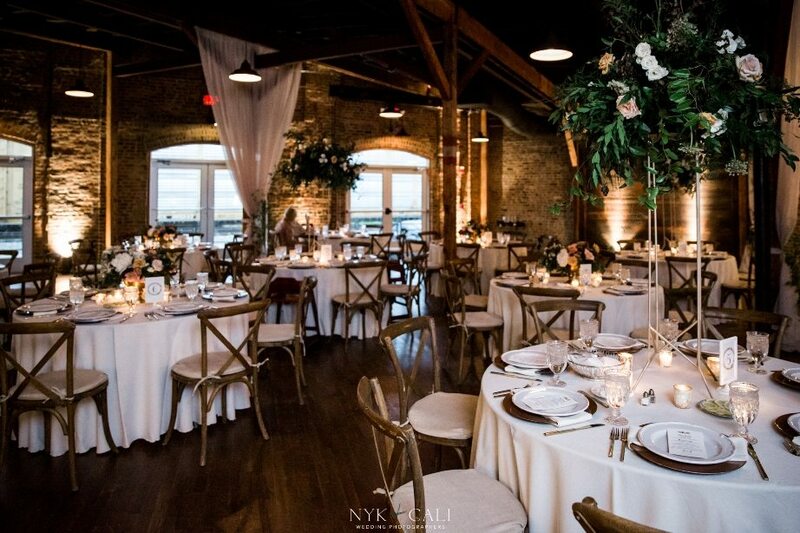 Such a chic and uniquely designed wedding for a gorgeous couple! 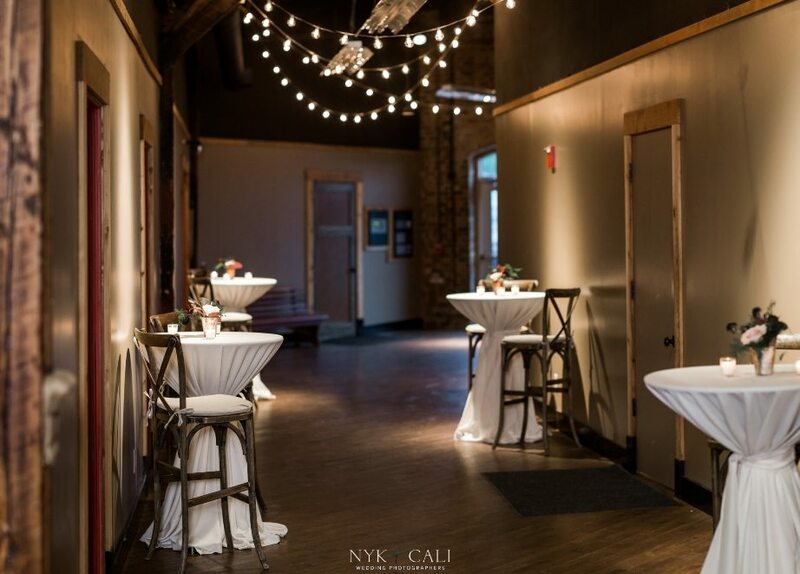 Photos by the talented John Myer Photography. 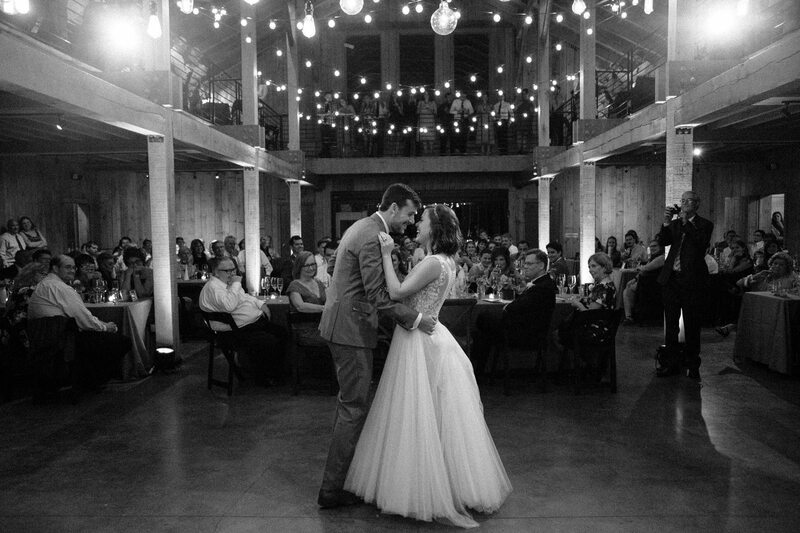 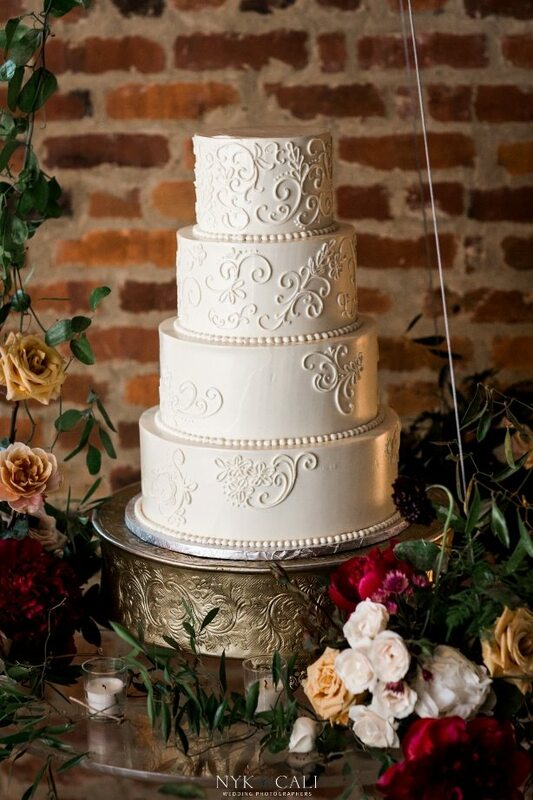 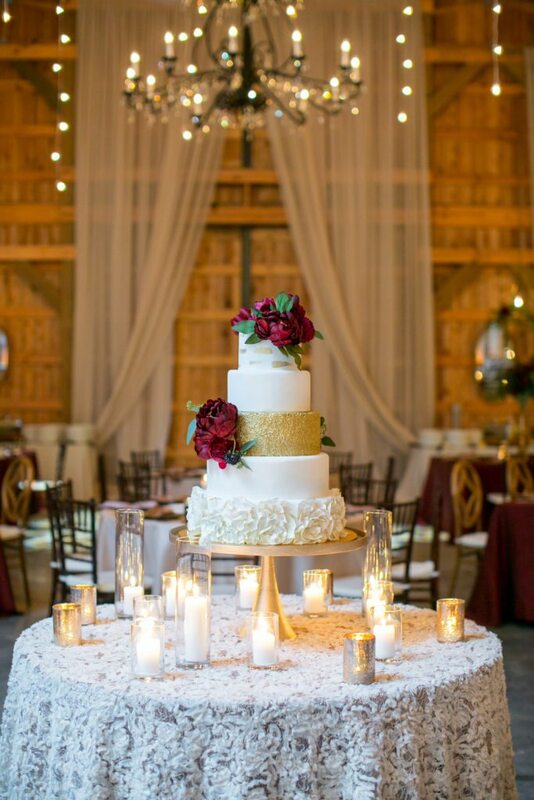 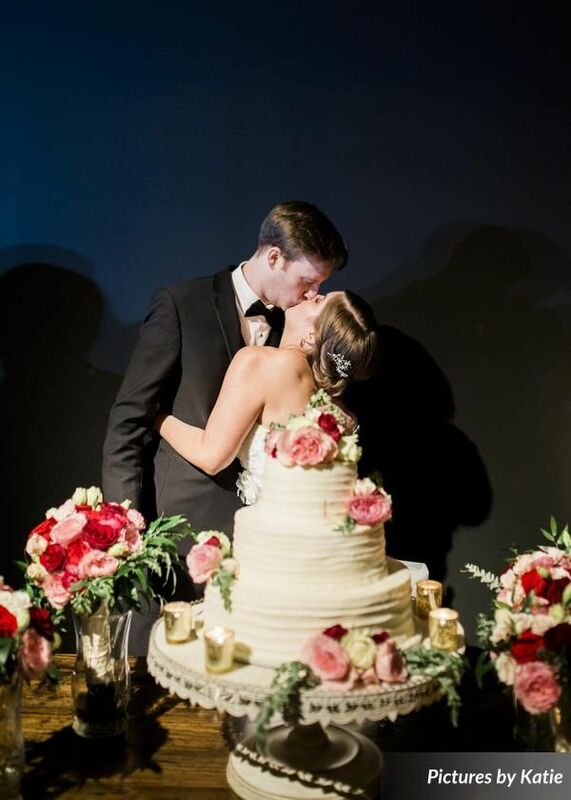 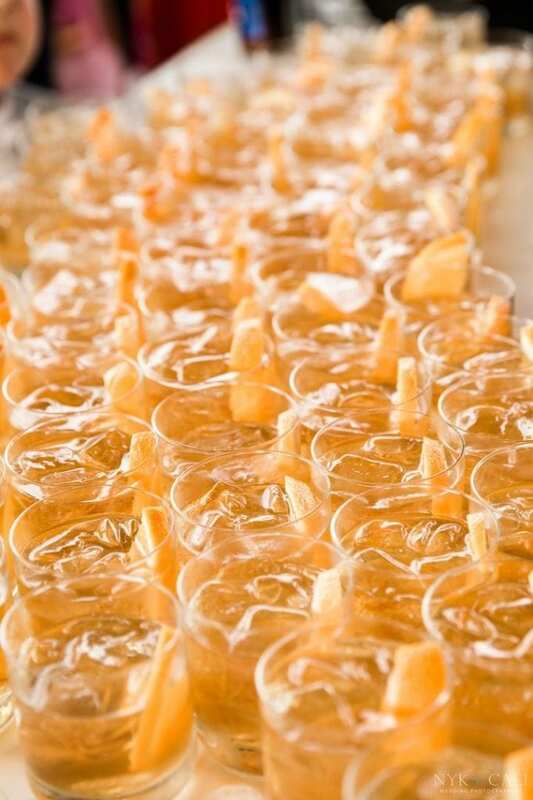 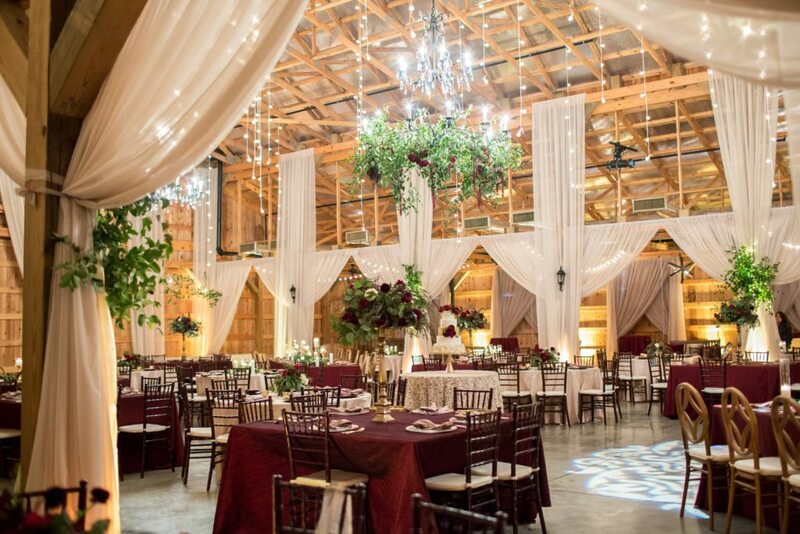 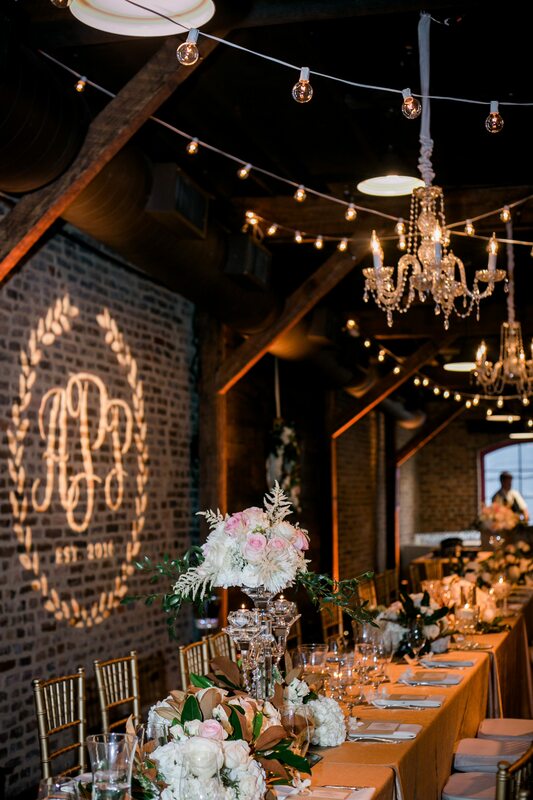 Ashley and PL’s wedding reception at Houston Station was a classic Southern stunner! 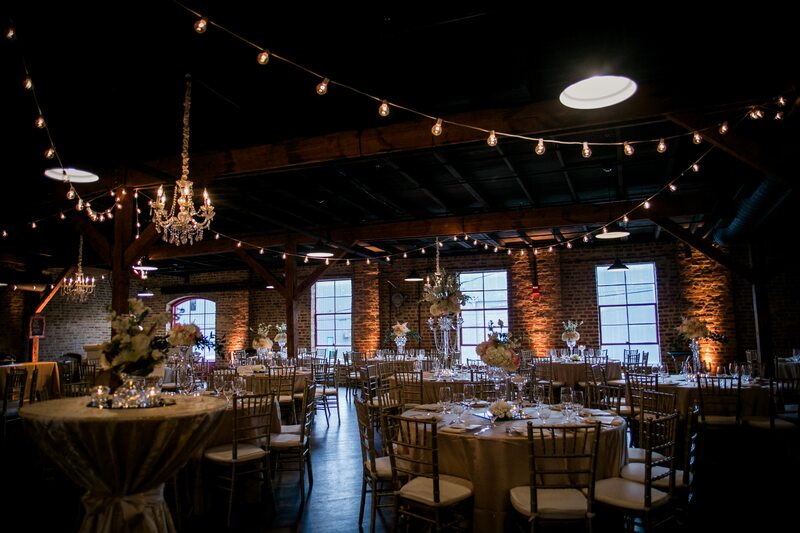 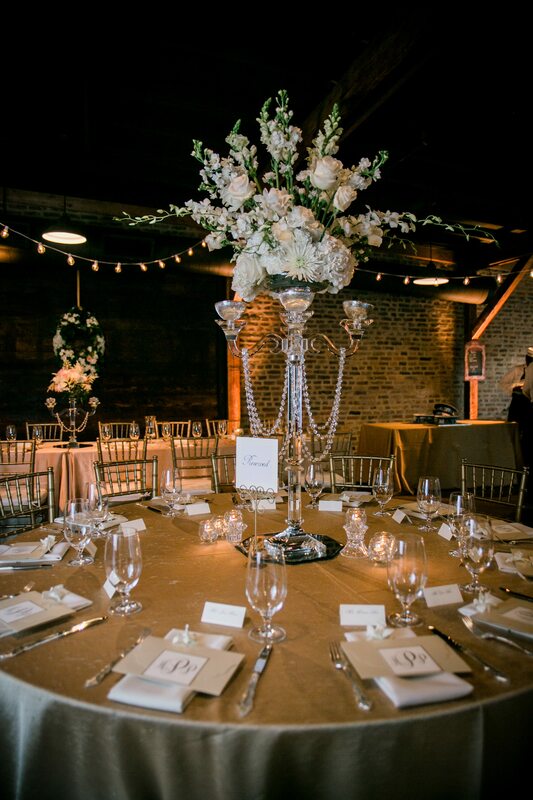 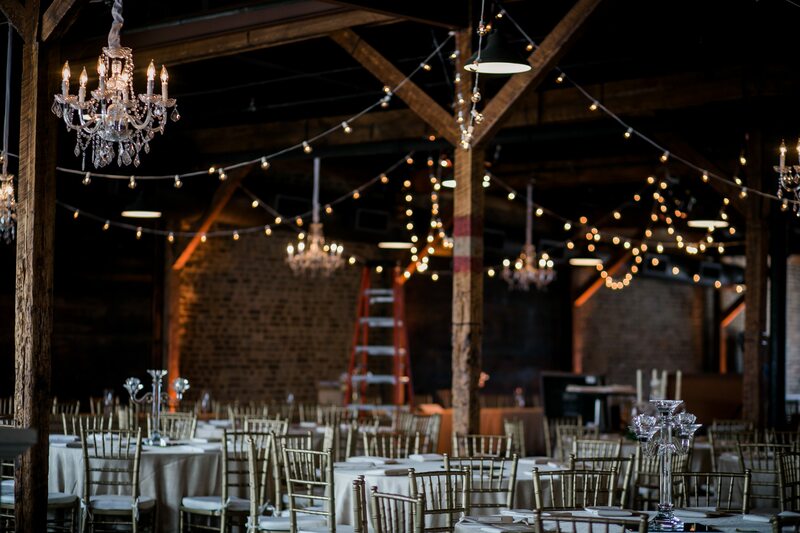 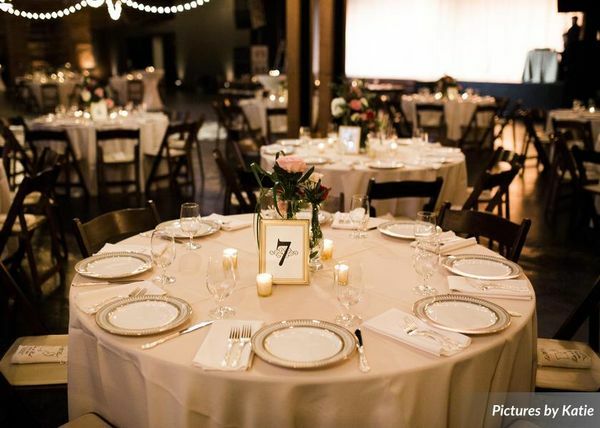 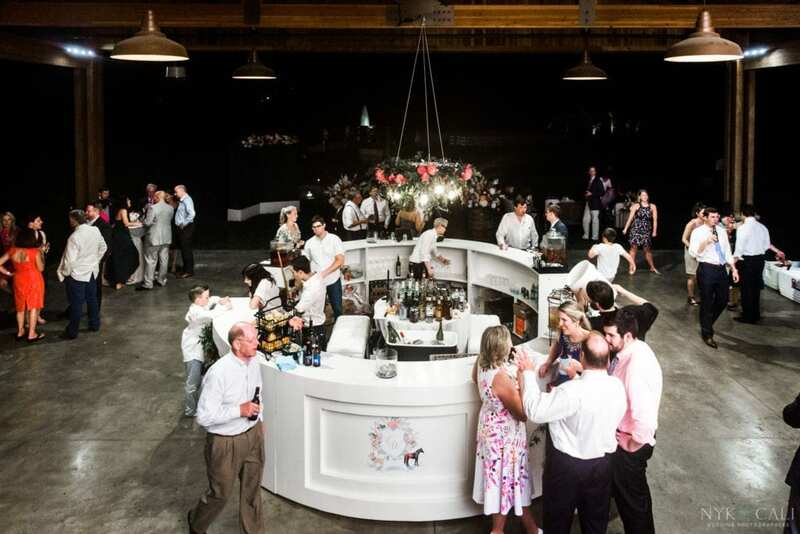 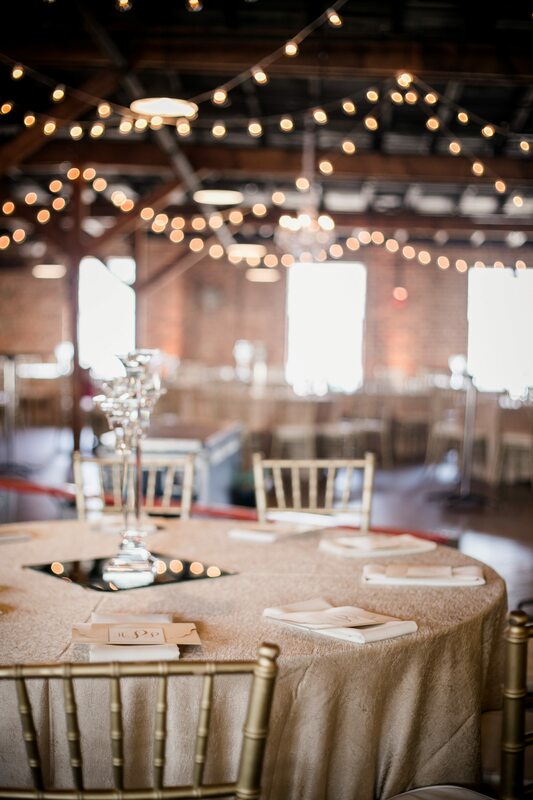 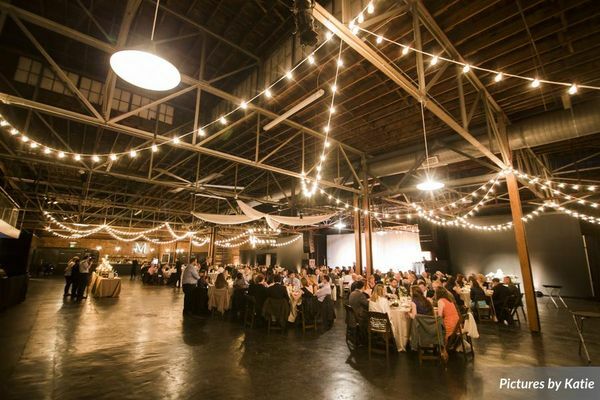 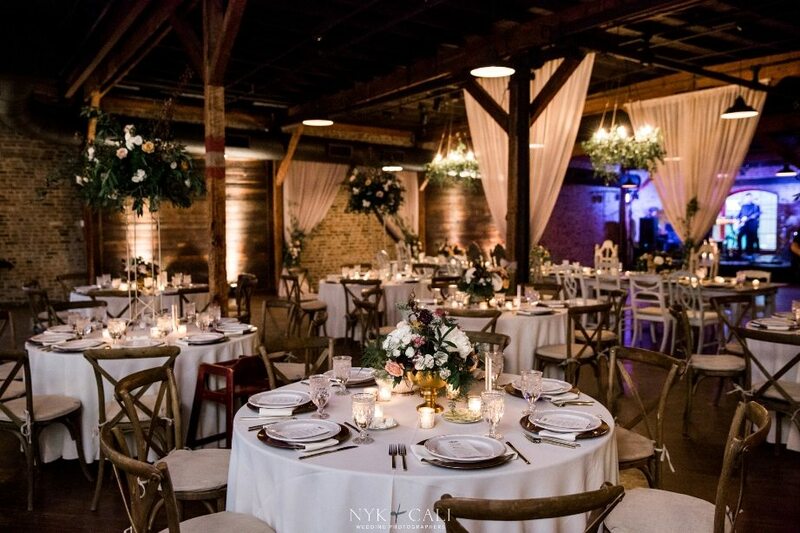 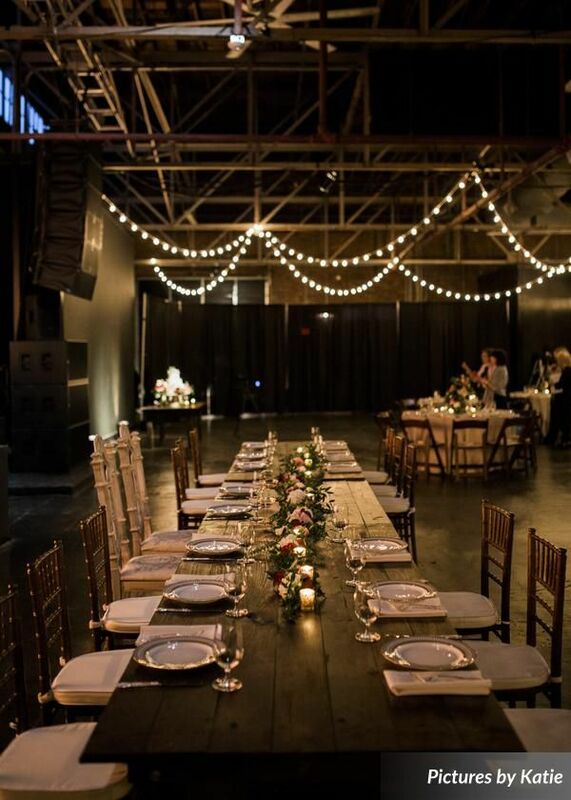 With accented gold and crystal details, the industrial event space in Nashville took on a elegant, yet relaxed feel. 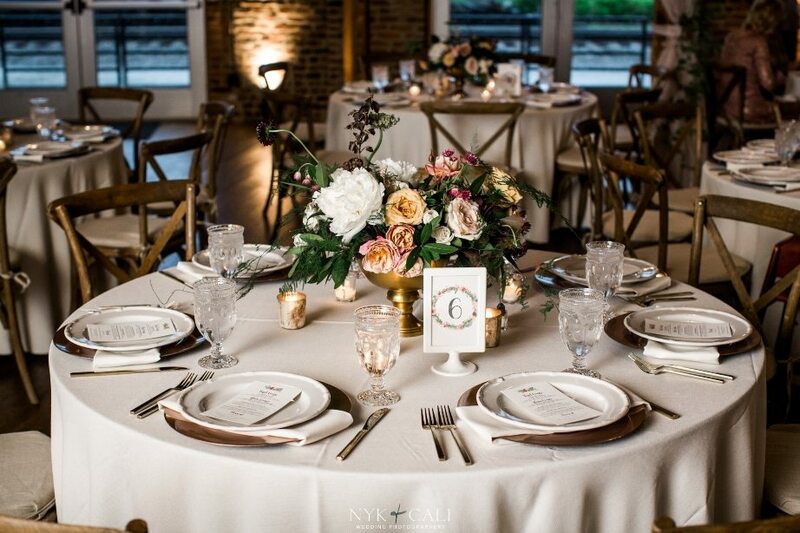 Tables were adorned with soft gold linens, vintage Abbey Flatware and unstated floral arrangements in a crystal pedestals while guests sat at Gold Chiavari Chairs with ivory cushions. 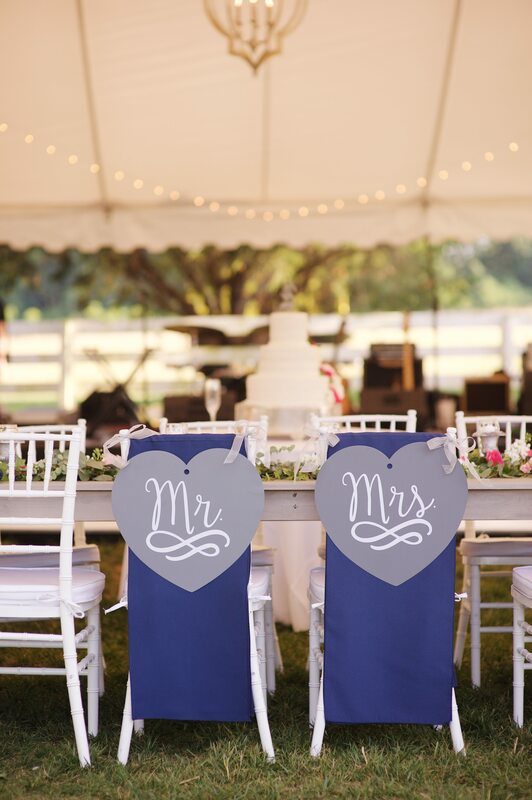 All in all, a perfectly classic wedding for a sweetly classic love! 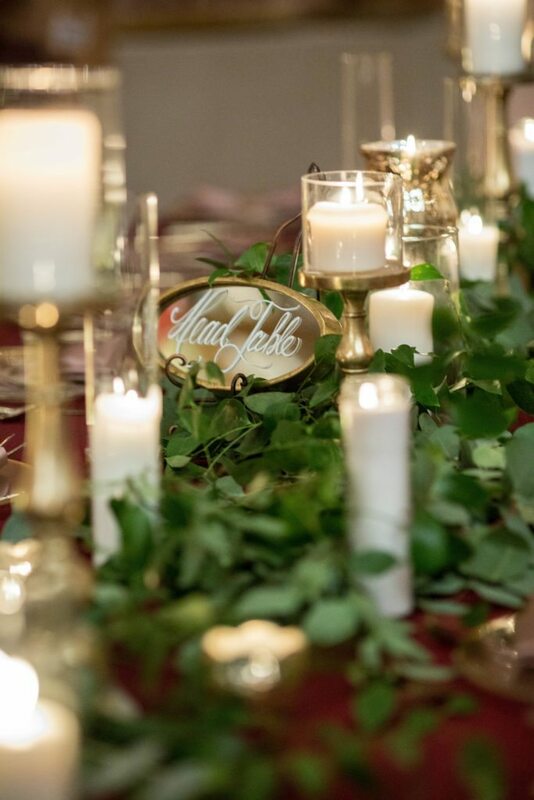 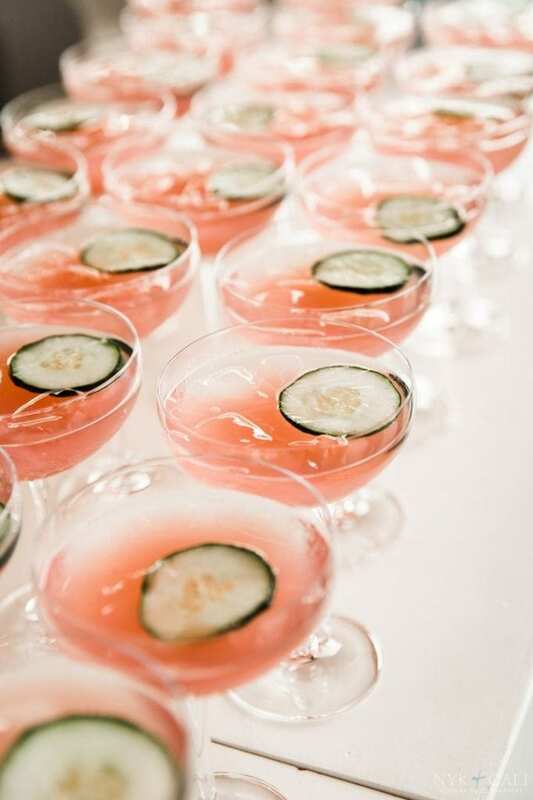 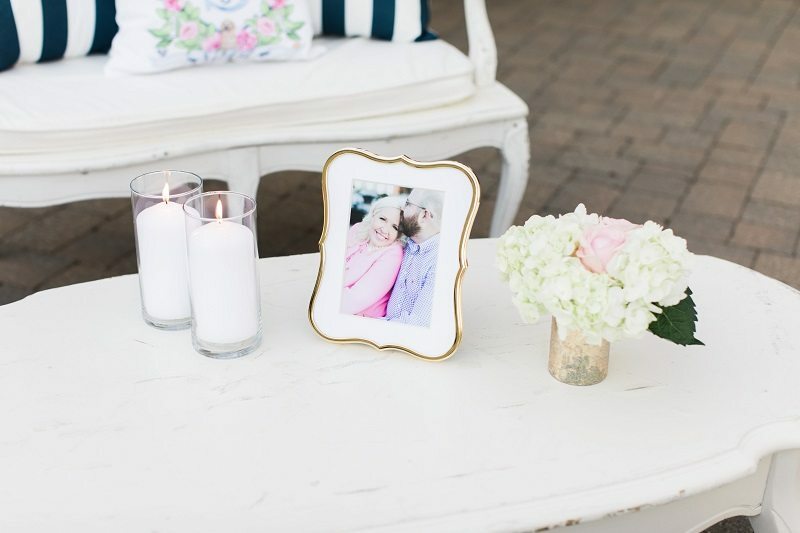 Thank you so much to Amanda May Photography for sharing the beautiful photos with us! 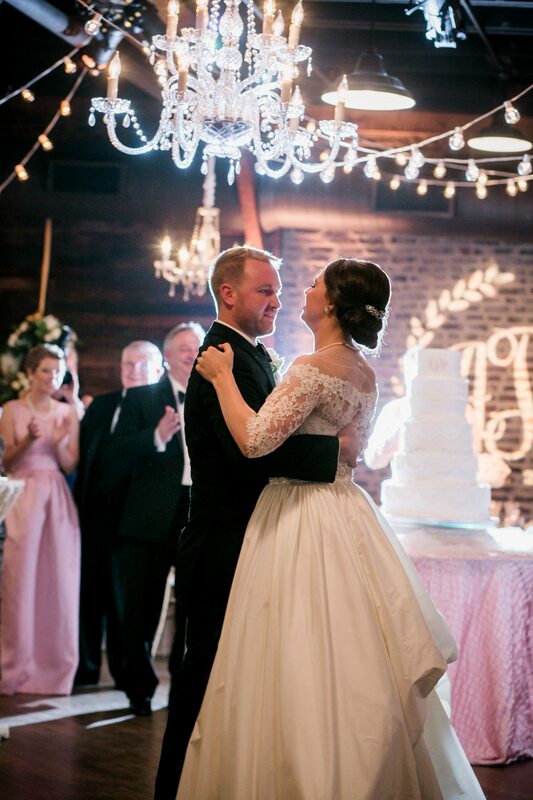 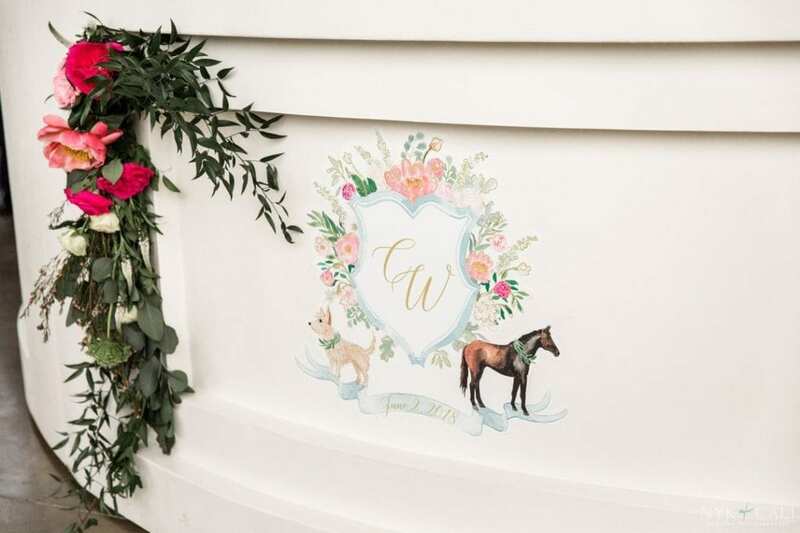 Julianne and Spencer had a big Southern wedding at one of Tennessee’s historical homes, with a preppy chic design that was elegant and relaxed. 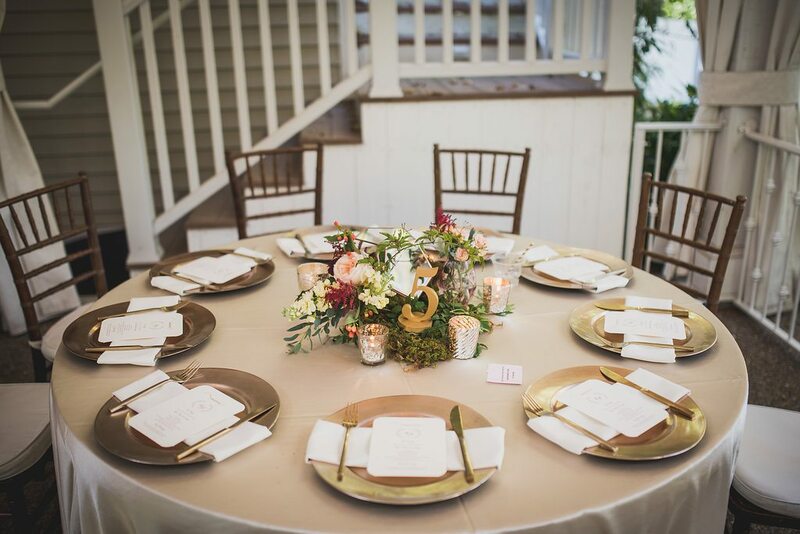 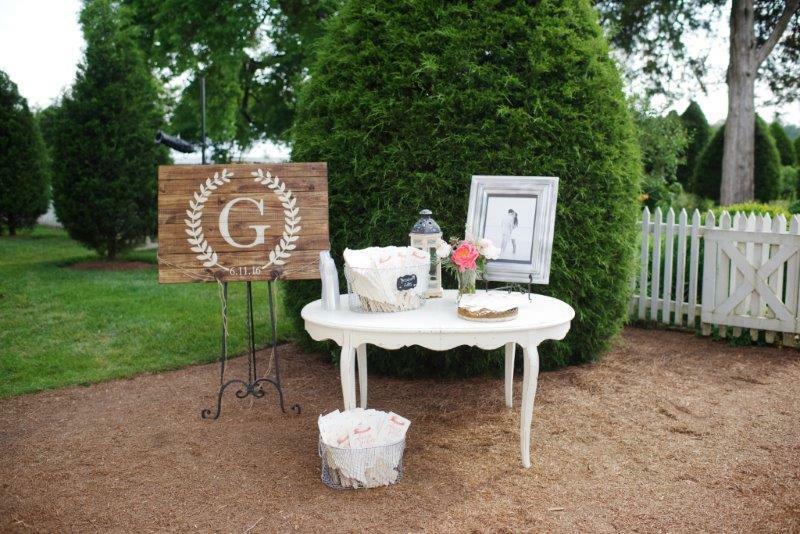 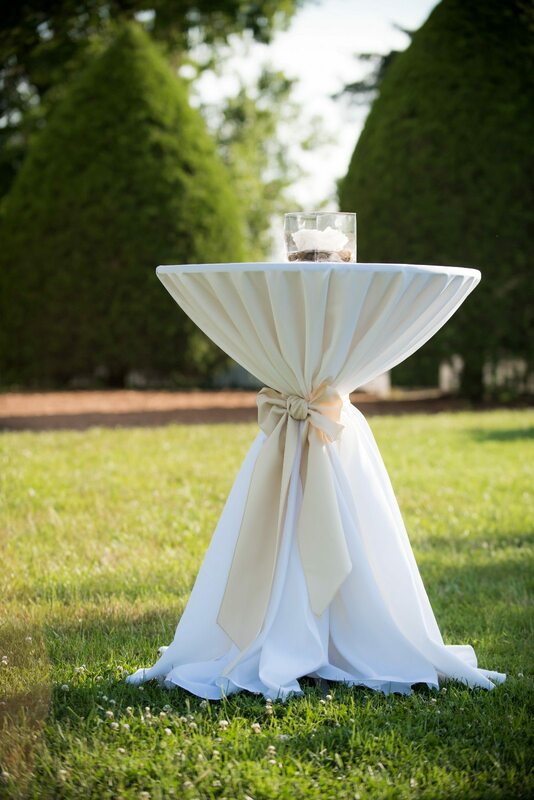 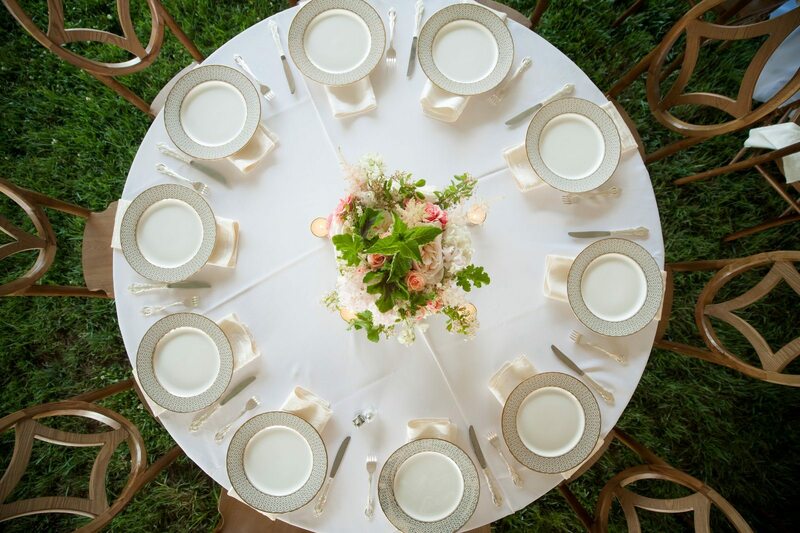 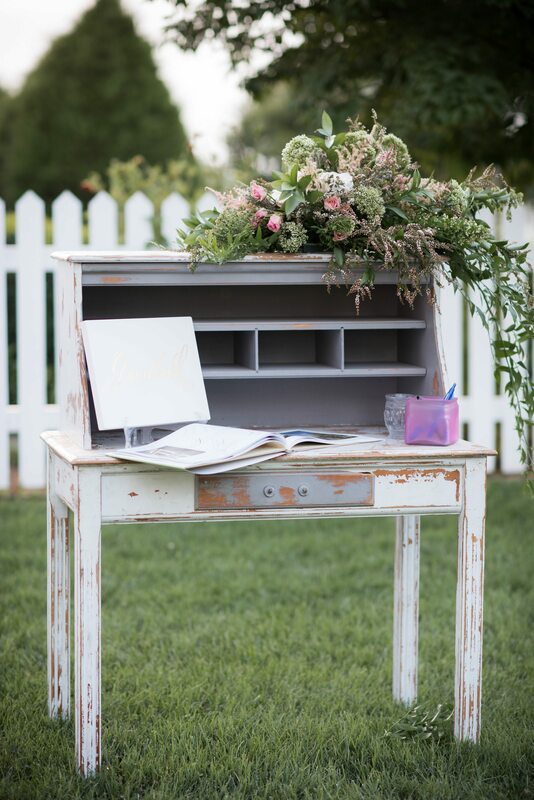 Guests were welcomed to the Carnton Plantation with programs placed thoughtfully on our Vintage Isabel Oval Table. 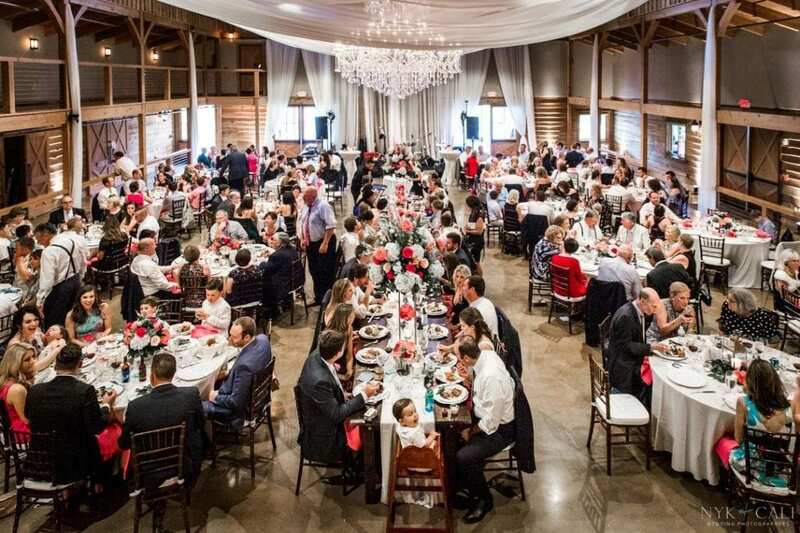 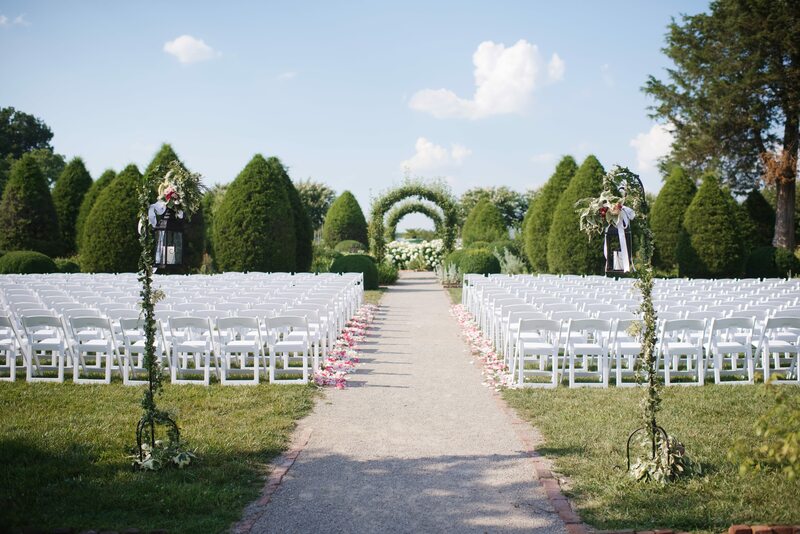 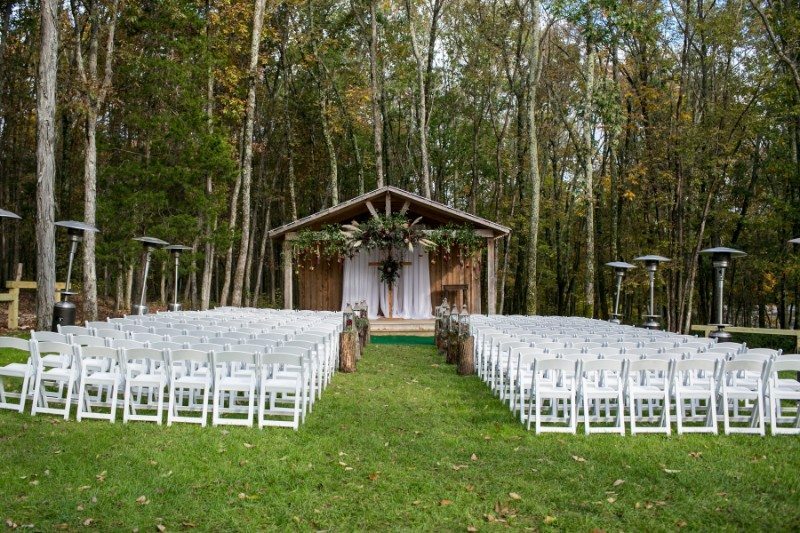 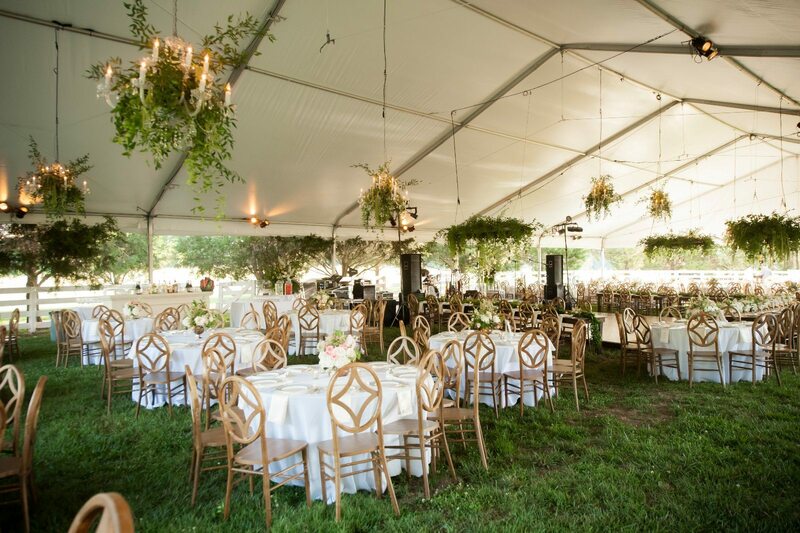 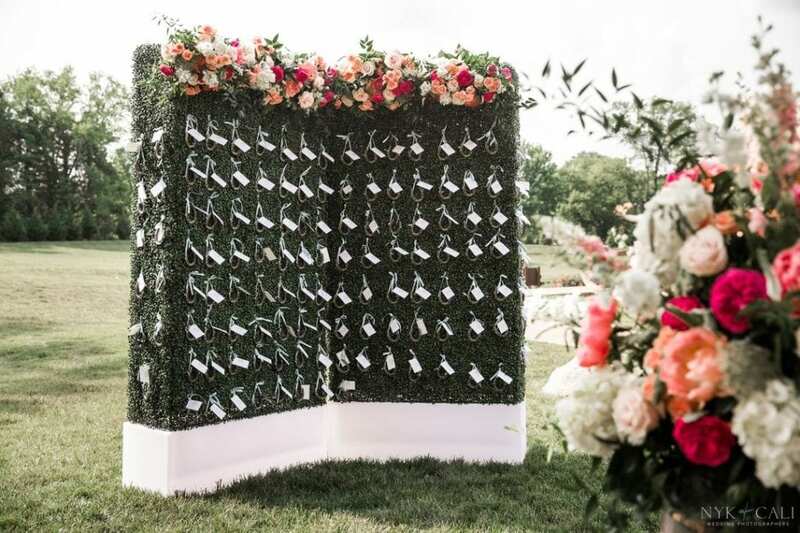 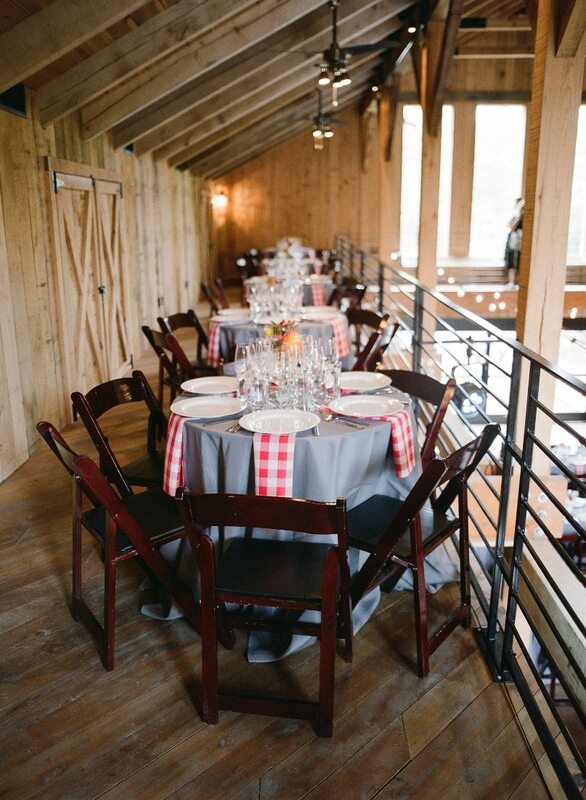 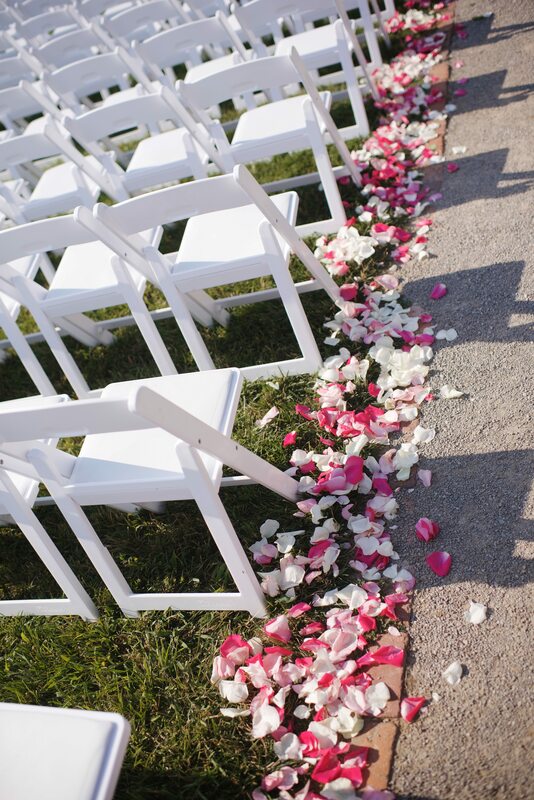 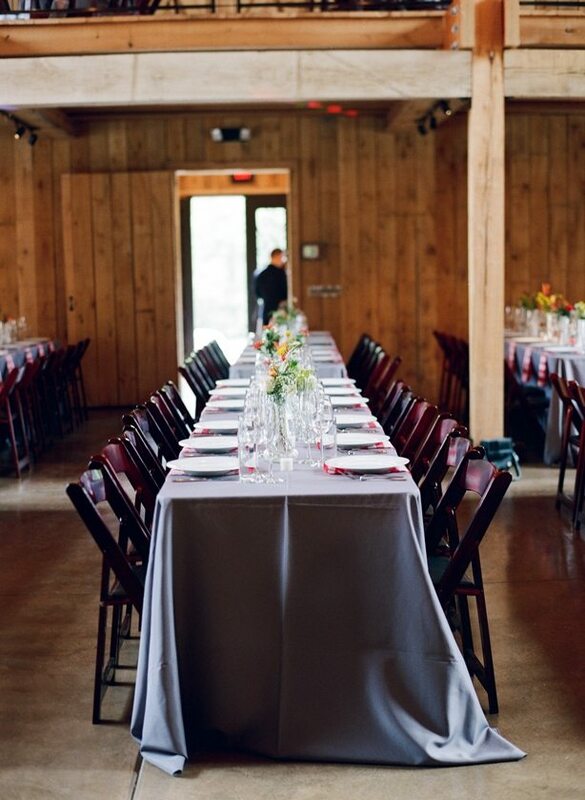 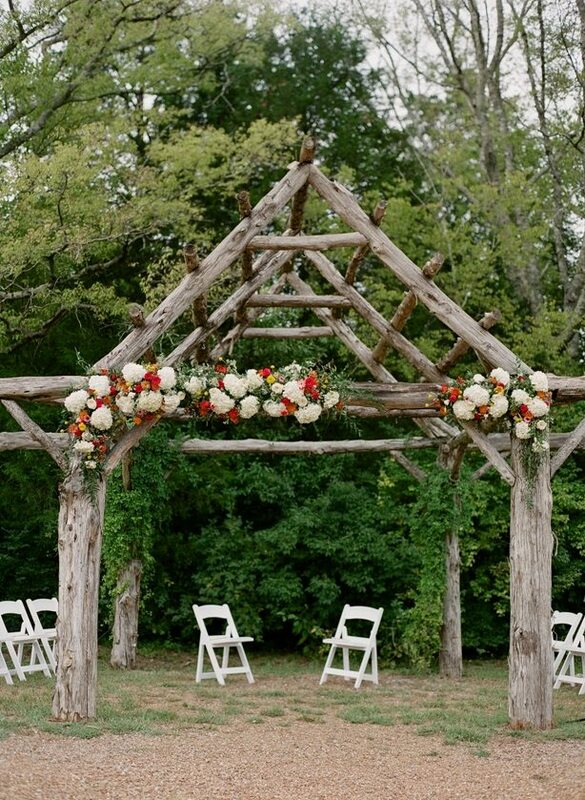 For the ceremony, hundreds of our White Resin Folding Chairs were placed for guests to comfortably sit. 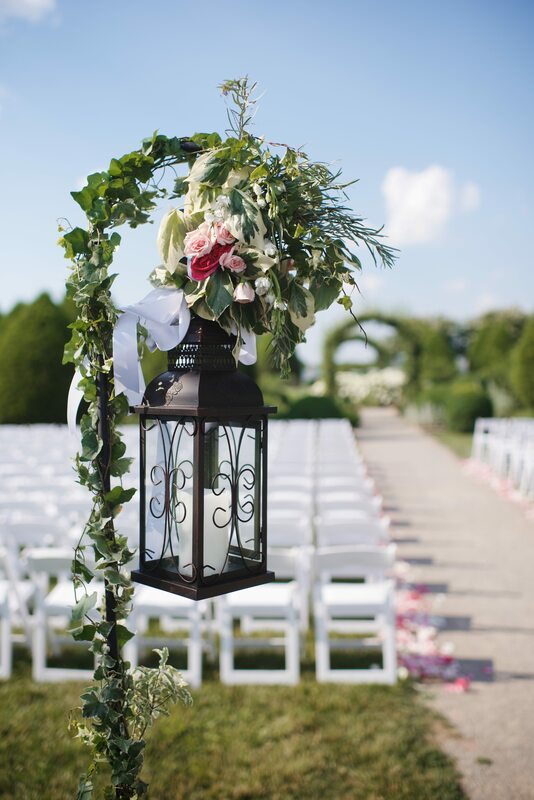 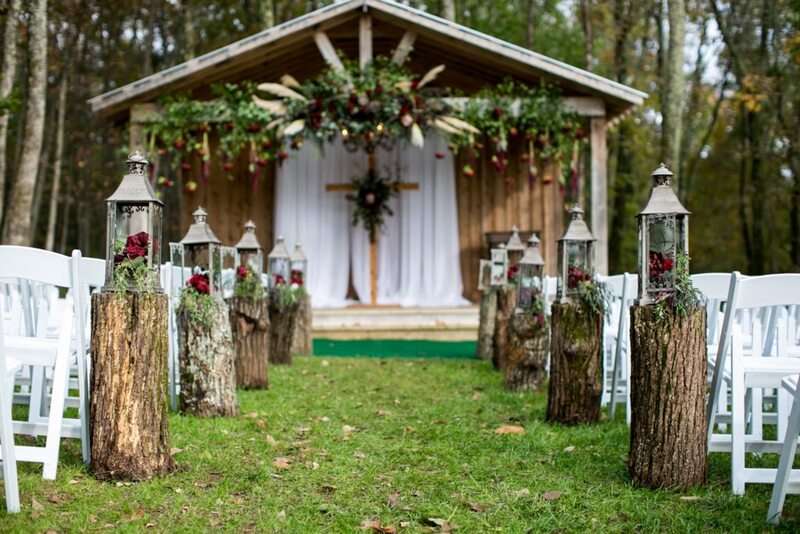 The aisle was lined with Assorted Oversized Lanterns and Wrought Iron Pew Markers, decorated beautifully by Enchanted Florist. 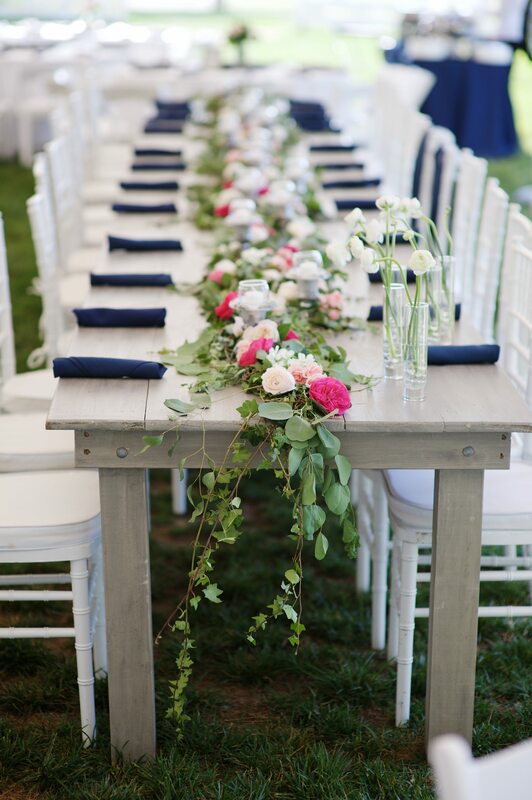 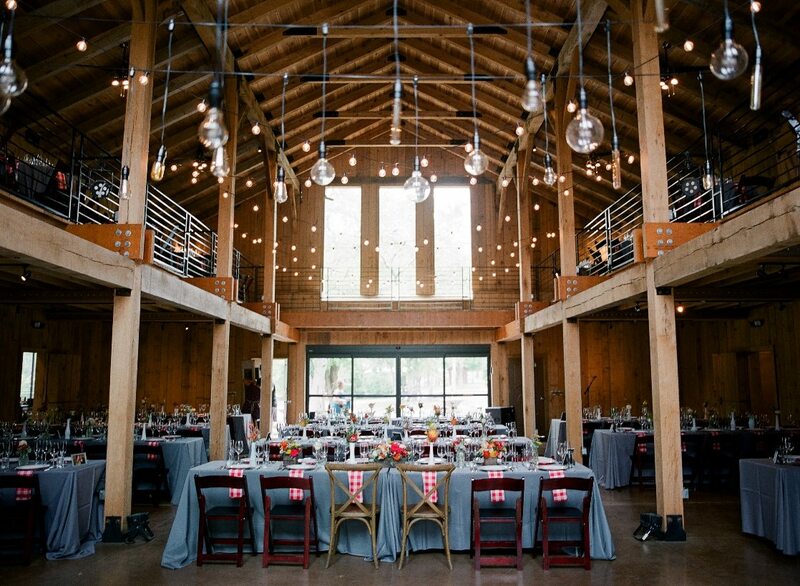 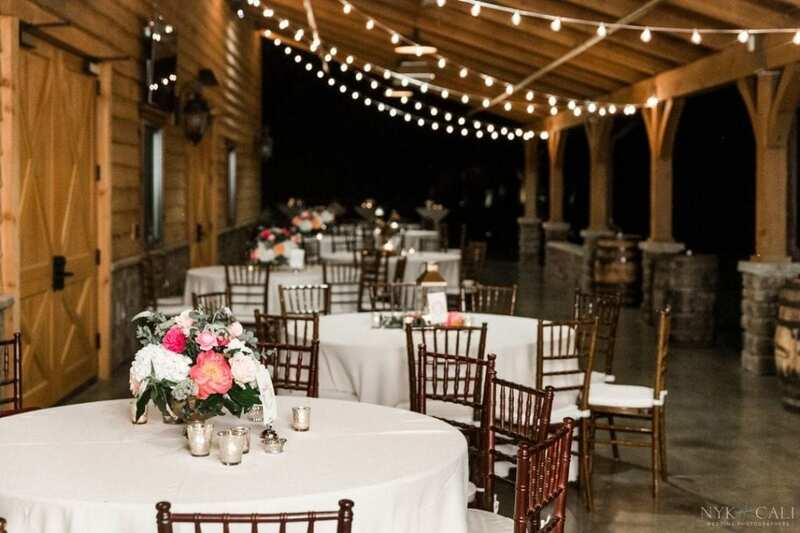 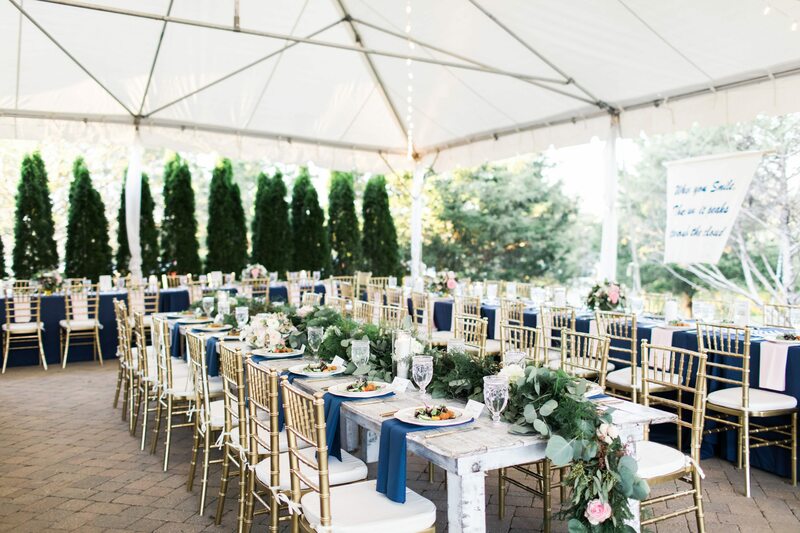 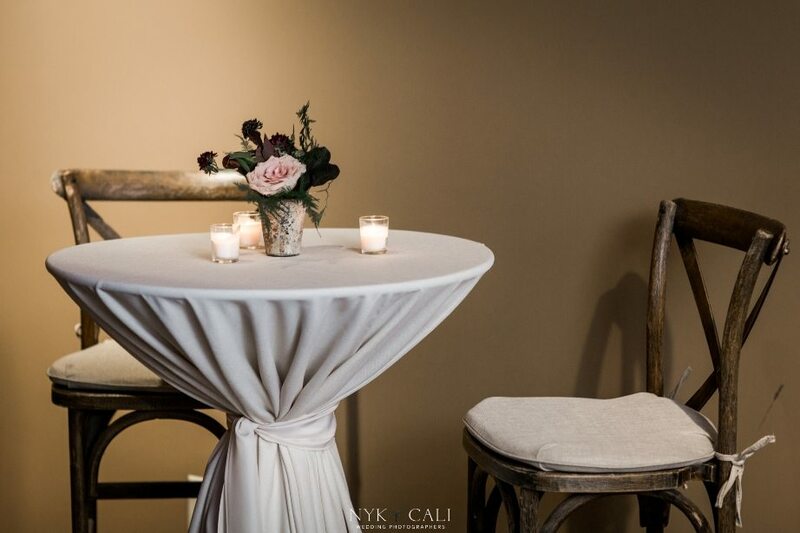 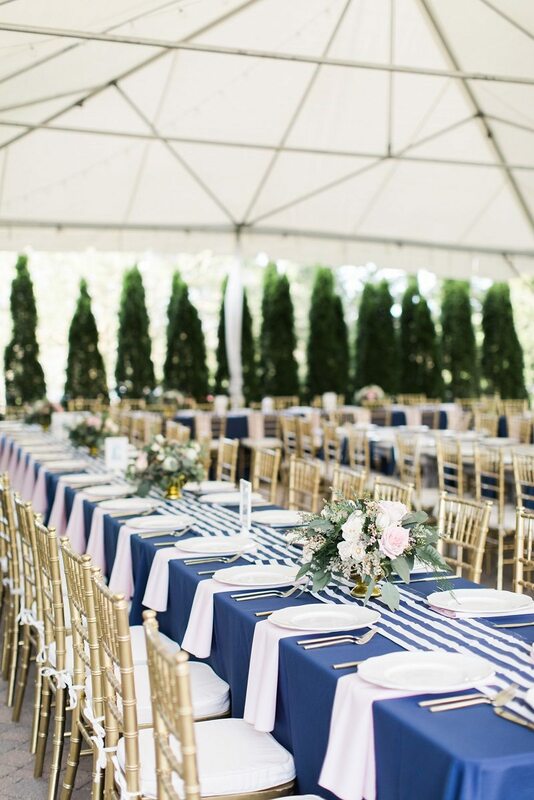 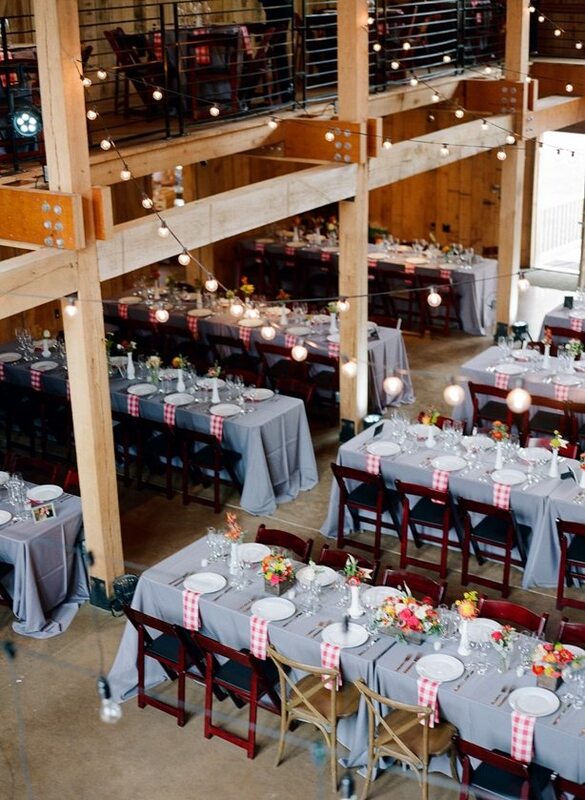 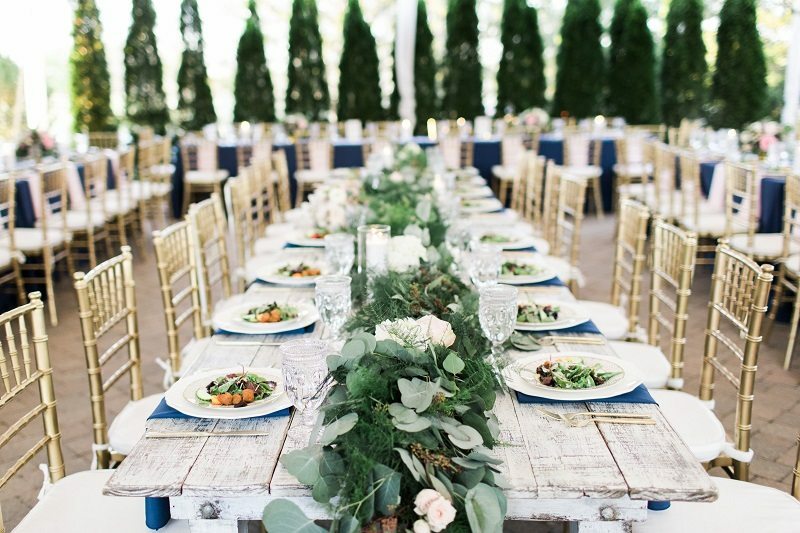 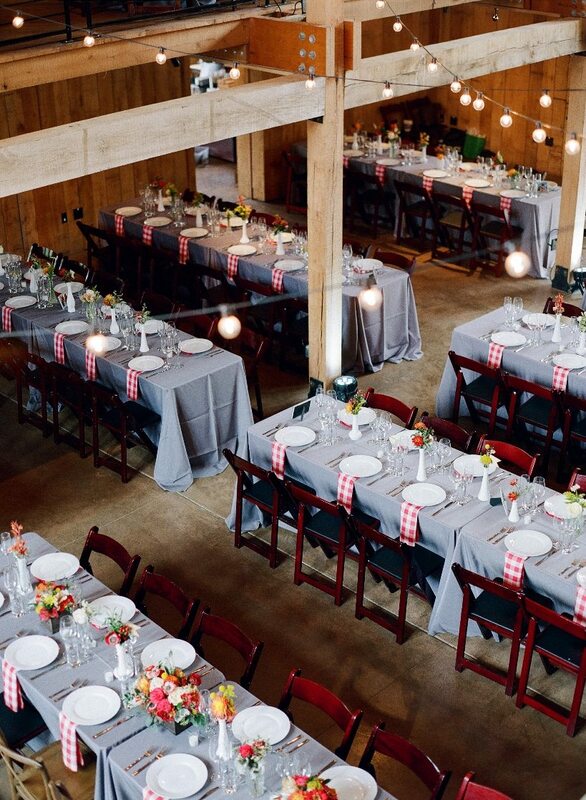 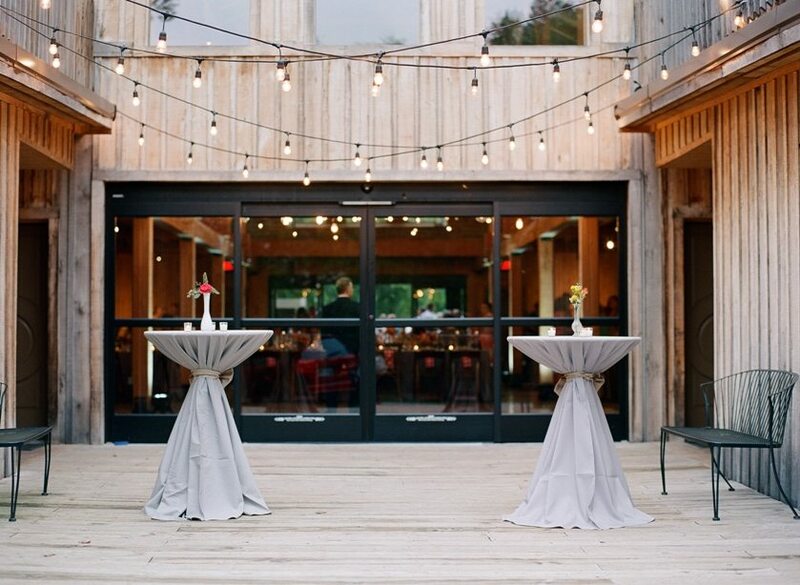 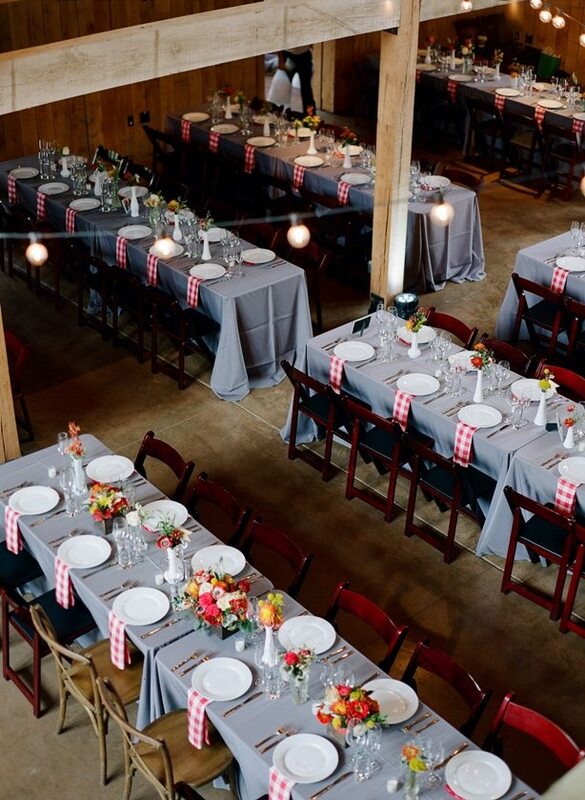 For the reception, the couple opted to keep the bright but rustic look with Grayson Farm Tables paired perfectly with our White Chiavari Chairs and beautiful blue linen napkins. 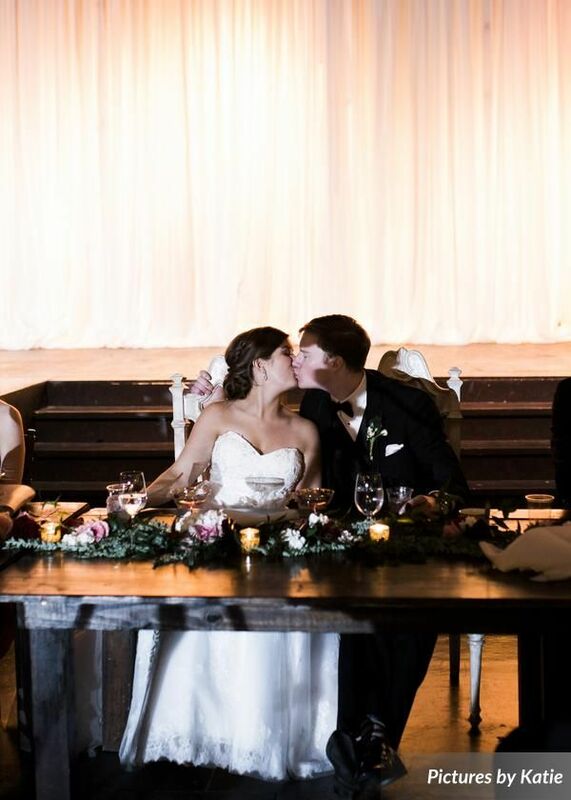 It was the perfect day and we were so happy to be a part of Julianne and Spencer’s happily ever after! 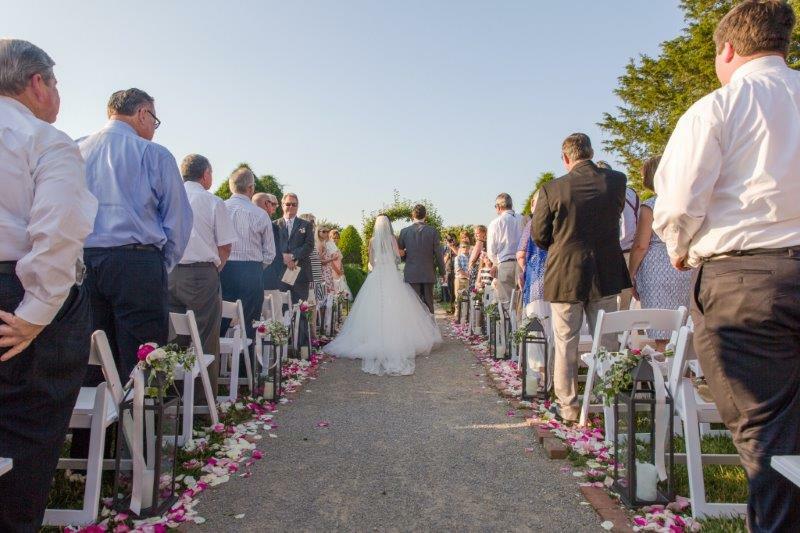 Thank you Justin Wright Photo for capturing these amazing photos.